Setting standards. 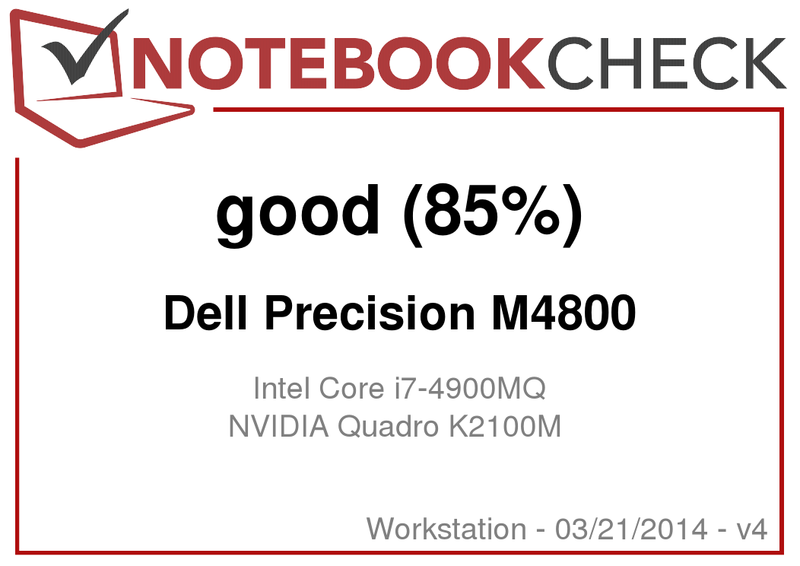 Dell's former Precision M4700 maintained its top position in our workstation ranking for a year. Now its successor is available and faces extremely high expectations. We exhaustively tested whether it really can live up to them. 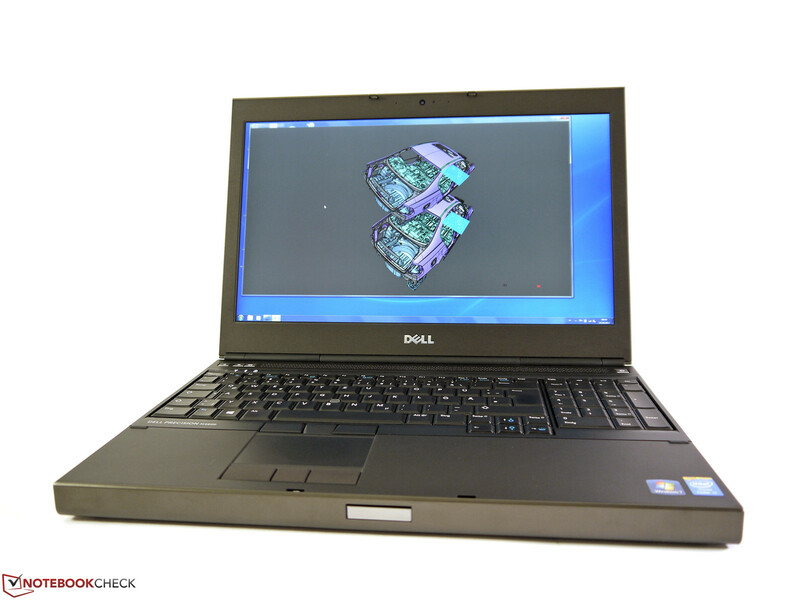 Dell's portable Precision workstations exhibited their qualities several times in the last model year. Besides their high-quality build, good configuration, and upgrade options, it was particularly their high performance fused with low operating noise that was impressive. The casing has been adopted but the innards have been updated. In addition to Intel's Core i7-4900MQ CPU and Nvidia's latest Quadro K2100M pro graphics, it is primarily the extremely high-resolution QHD+ screen that stands out. 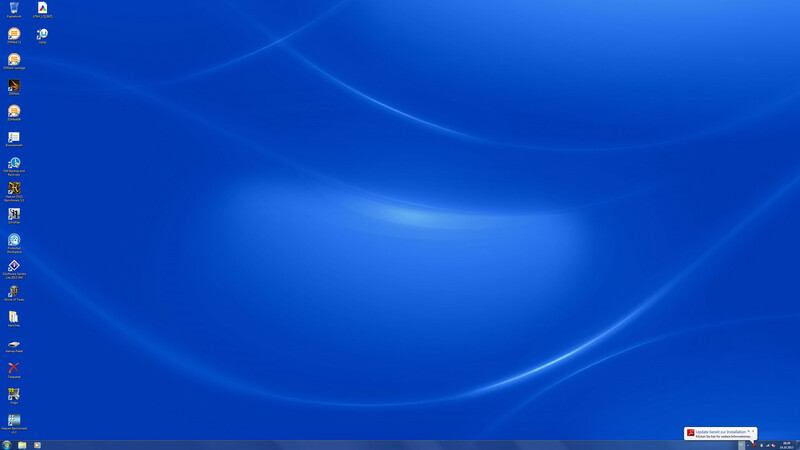 It offers an especially big desktop owing to 3200x1800 pixels. This blaze of performance almost lets the 16 GB of working memory and the large 256 GB solid state drive fade into the background. 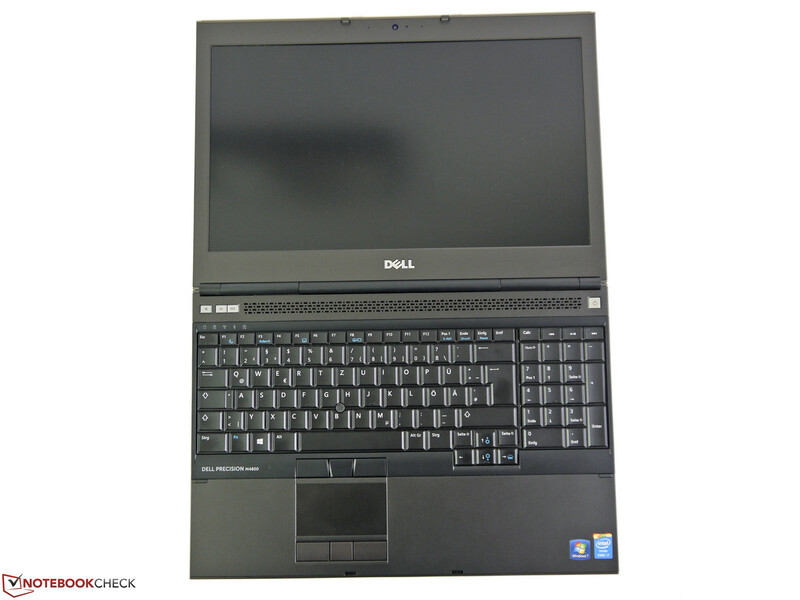 However, the present Dell Precision M4800 workstation is not a bargain with a current price of approx. 2850 Euros (~$3931, gross) and will likely only come into question for very aspiring home users besides the targeted professional user group. 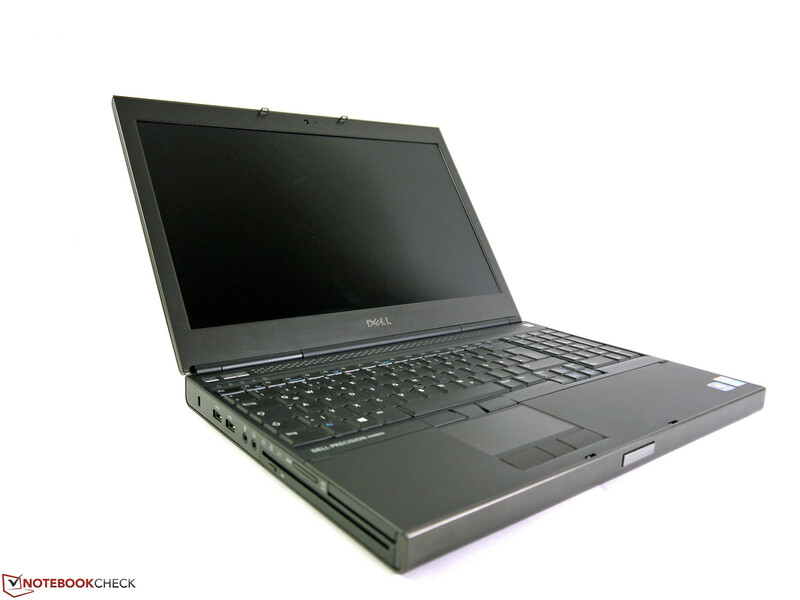 The casing of Dell's Precision M4800 uses virtually the same chassis as from the three former generations. The applied materials still make a good impression and provide a quality-looking exterior. 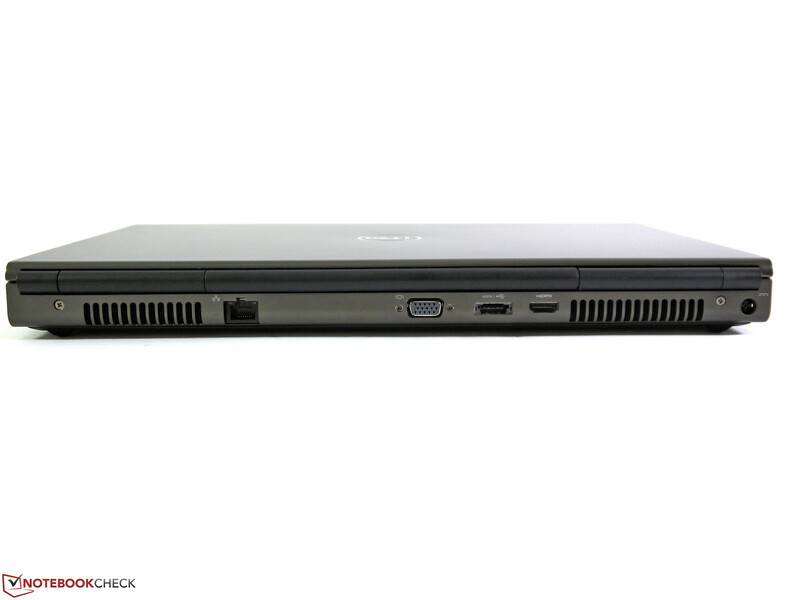 The rock-solid 15-inch Precision barely exhibits any weaknesses and features an impeccable build. The wrist rest is firm, the keyboard does not yield and the stiffness of the base unit and display lid are above-average. 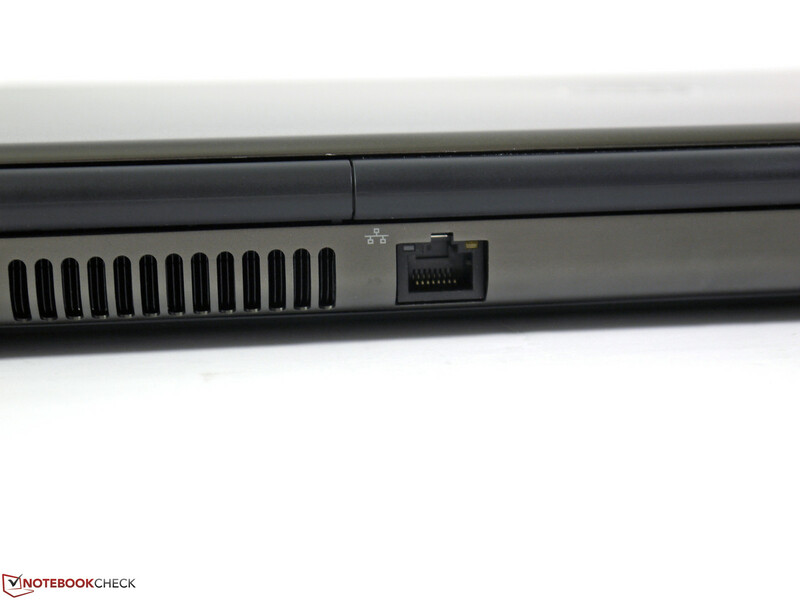 Only the area above the ExpressCard slot can be dented marginally. Dell's engineers take a high weight of approx. 3.2 kg into account to achieve this overall great stability. Lenovo's ThinkPad W530 is roughly 400 grams lighter with 2.8 kilograms. Dell has announced an alternative mobile workstation in ultrabook size to be launched this year for designers with high mobility requirement. 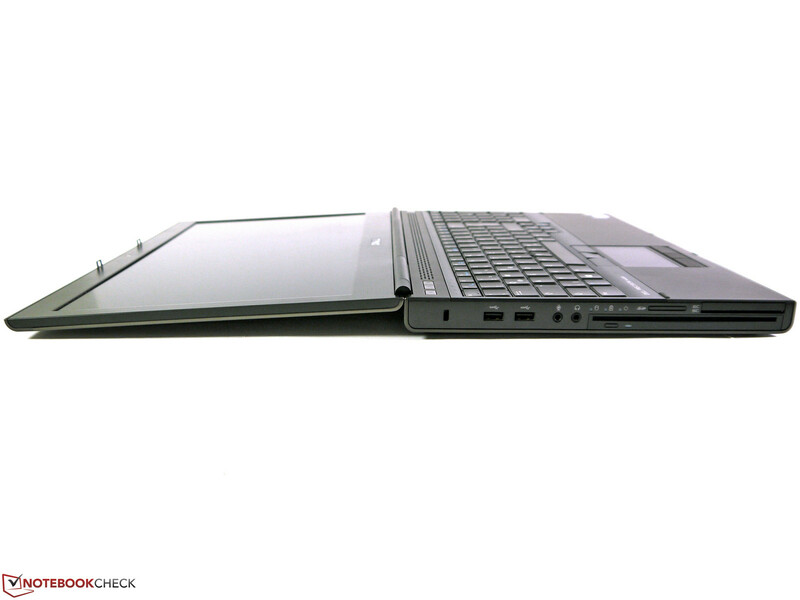 Dell's Precision M3800 will be much slimmer and lighter but likely not as powerful. Not many modifications have been made in this section either. 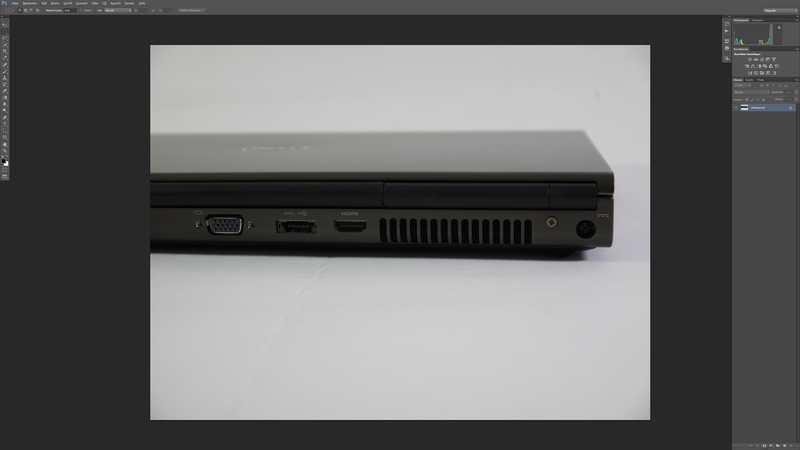 The FireWire 400 port has now been omitted and allows a more generous spacing of the interfaces on the casing's left. 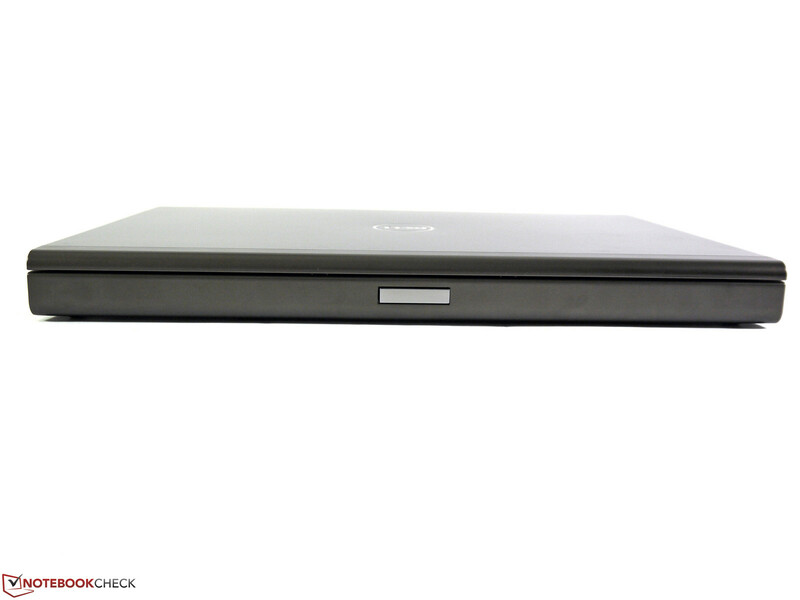 Otherwise, our review sample sports an optical drive designed in the space-saving Slim-Line format with slot-in mechanism, four USB 3.0 ports and one USB/eSATA combo on the rear. As usual, there are three possibilities for connecting external monitors: VGA, DisplayPort and HDMI. Dell's own Wireless 1601 802.11n adapter including Bluetooth 4.0 is installed for wireless communication. It features three antennas, one of which is reserved for the Bluetooth module. 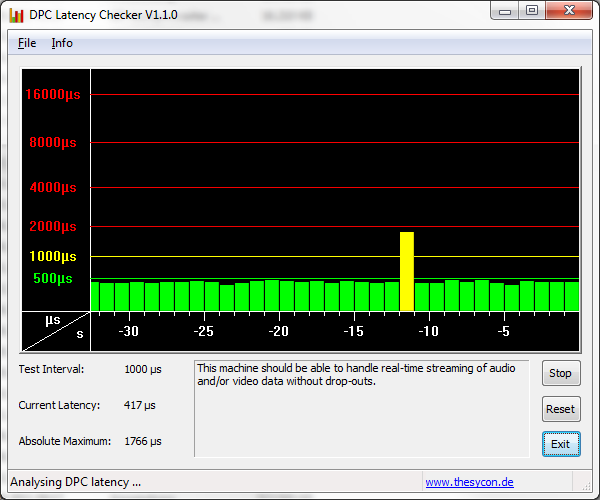 The Wi-Fi adapter transmits in the 2.4 GHz band and theoretically achieves a maximum of 144 Mbit/s. We did not ascertain any connection issues while using Wi-Fi in the test period. At times over 5 MB/s was possible at a distance of 10 meters to an 802.11n router with a Ralink RT2860T chip on sight. Although a WWAN is not available for mobile internet, the required antenna cables and an empty slot are present. It would be possible to insert an mSATA SSD here. The HD webcam suffices for routine video-calling tasks and also copes quite well with low light. As usual, a Gigabit LAN port is installed for cabled network connections. At first glance it surprises a bit that a laptop from the business category priced at almost 3000 Euros (~$4138) lacks a fingerprint reader. 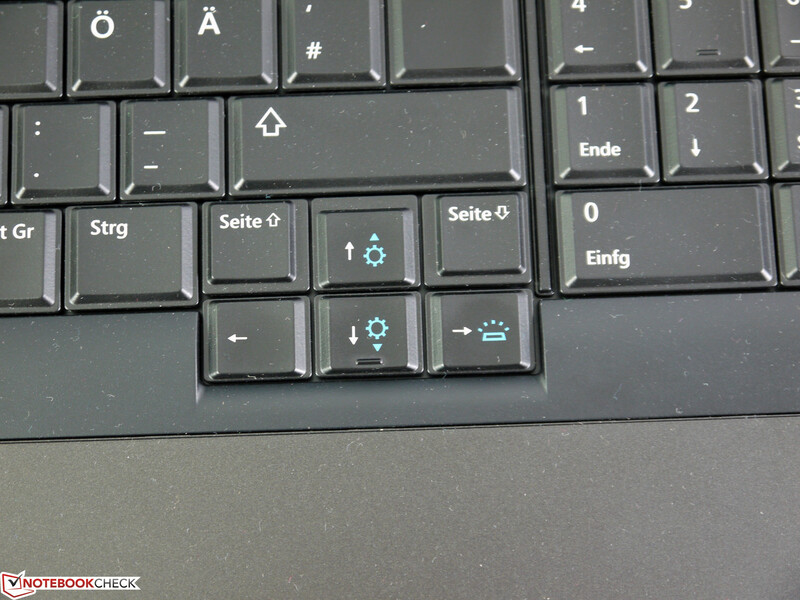 Even many entry-level laptops have this feature and should actually not be left out here. However, the otherwise extensive security standards found when looking closer make up for that. 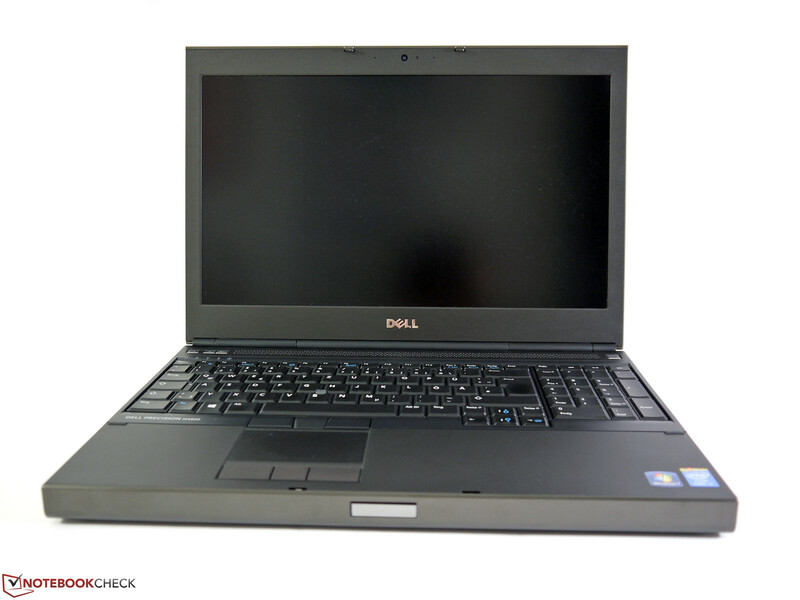 In addition to the often available BIOS, Admin, HDD and system passwords, our review sample of Dell's Precision M4800 includes a SmartCard reader, Trusted Platform module and Computrace function that can be enabled. 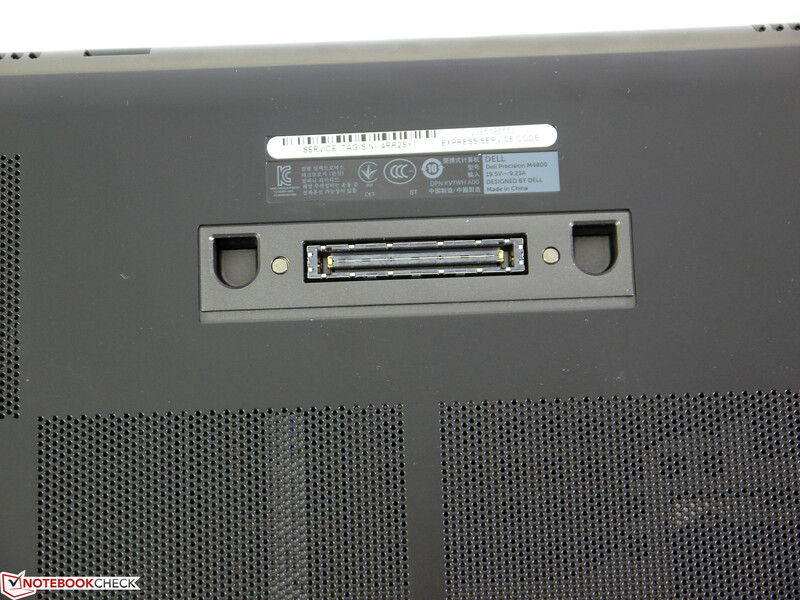 Since Dell has obviously not modified the docking port, it is possible to use the docking stations from former models. However, Dell's Advanced E-Port II port replicator for around 280 Euros (~$386, gross) and Dell's D5000 Wireless docking station for around 270 Euros (~$372, gross) are available should the user want to buy a new one. As usual, Dell comes up trumps in maintenance. Only the battery and two screws have to be removed to take off the base plate. All components can be accessed and replaced easily afterward. The single steps are described in-depth in the owner's manual. Both fans can be cleaned and, when necessary, be replaced without problems. 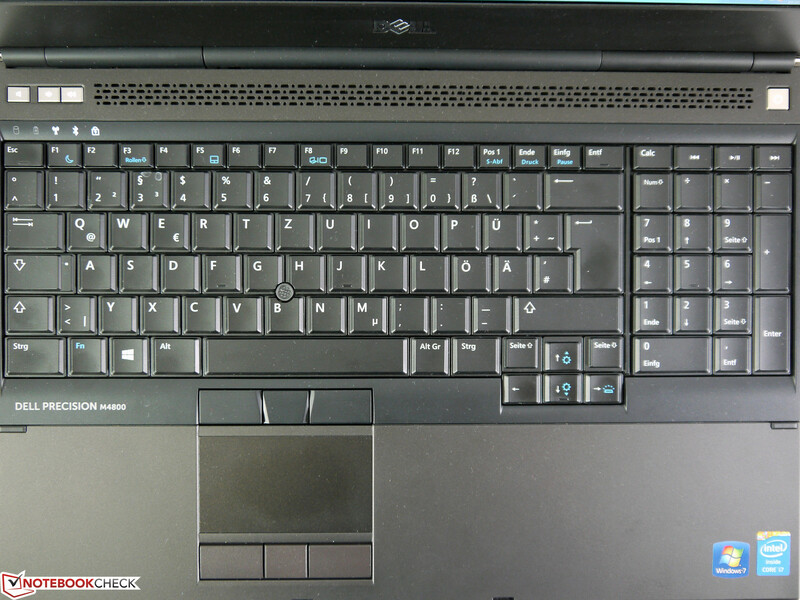 Two additional RAM banks are underneath the keyboard in the quad-core models. 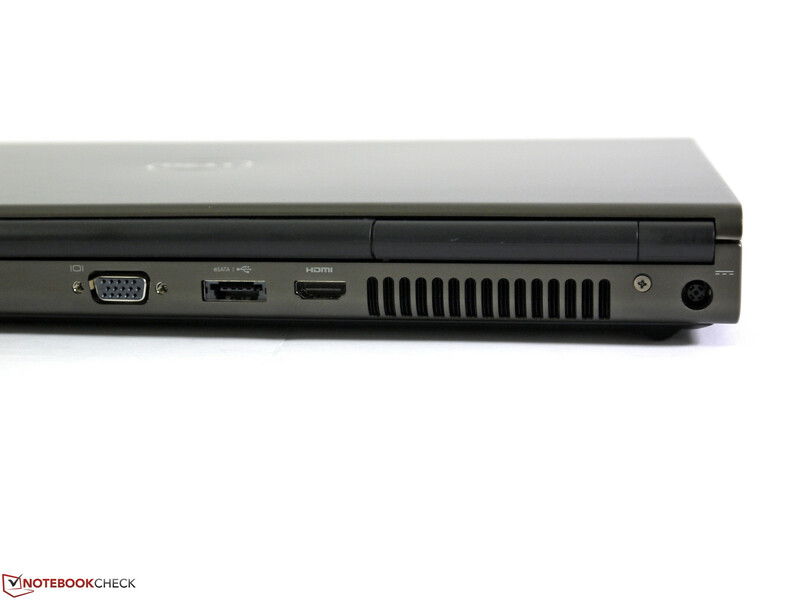 Dell's Precision M4800 standardly includes a 3 year basic on-site service for the next business day. Upgrades or service extensions are available optionally. For example, a 5 year ProSupport with on-site service for the next business day cost approximately 480 Euros (~$662, gross). 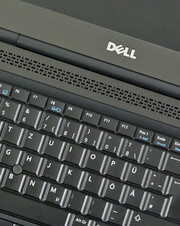 Like in many other areas, Dell did not modify the input devices at all. The keyboard still features a crisp, quiet stroke, medium drop and firm impression. 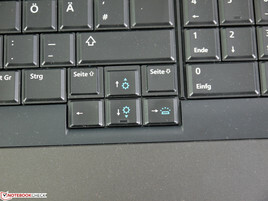 The layout, key size and special functions are good. The keyboard's backlight can be set in four levels and the dedicated number pad will prove to be convenient particularly when entering time-consuming rows of numbers. The TrackPoint is still an accurately working alternative to the touchpad and has dedicated keys. They can also be remapped as additional touchpad buttons and thus supply more functions. 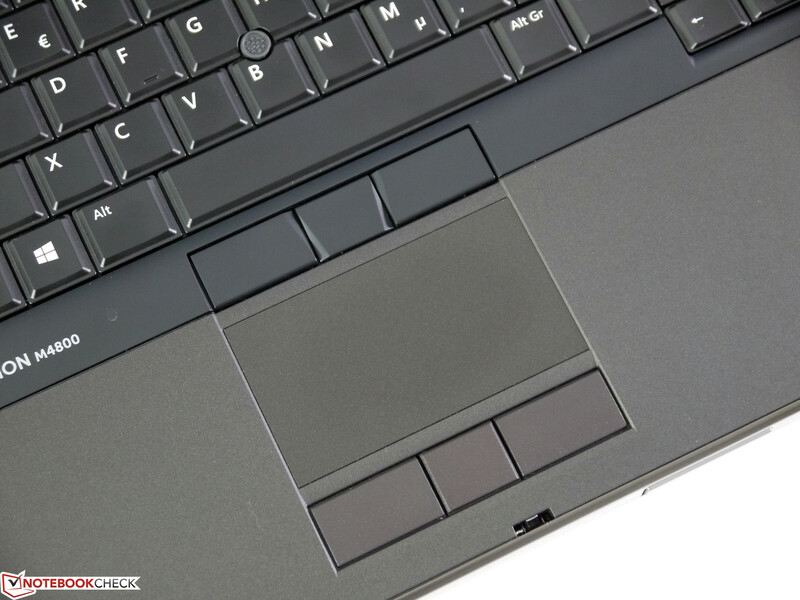 The touchpad itself features pleasant gliding traits and a decent responsiveness. It is no longer state-of-the-art for multi-touch gestures due to its input surface area of 80 x 45 mm and could definitely be bigger. 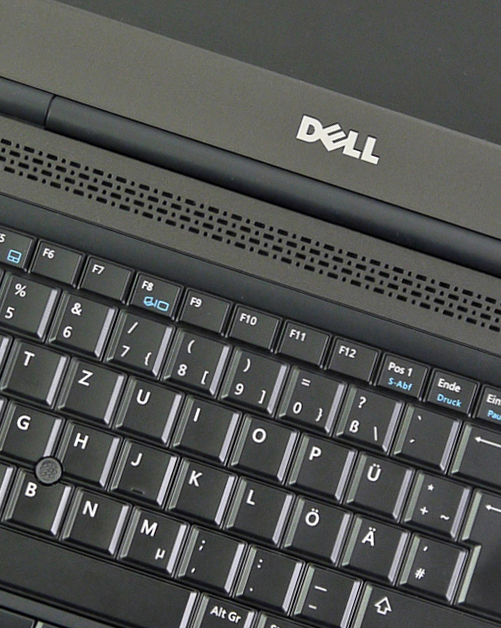 Dell offers three different screen models for its Precision M4800. 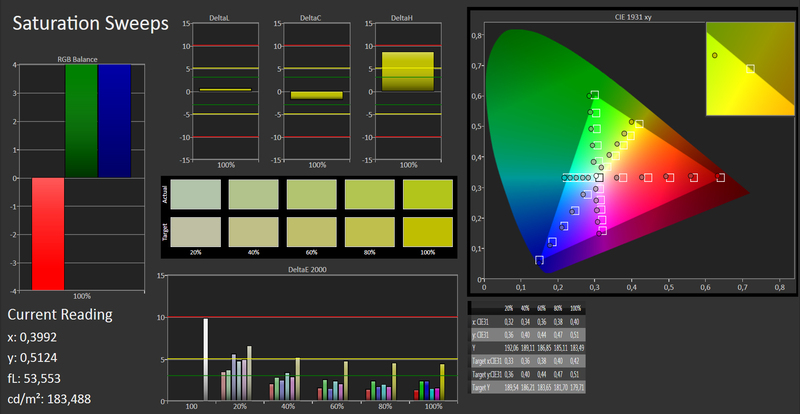 Most users will probably not opt for the entry-level model with a resolution of 1366x768 pixels. This screen is simply too coarse and particularly professional users will unlikely find it appealing. However, the equally non-reflective FullHD screen with wider viewing angles will prove to be considerably more practice-oriented. It provides a good ratio of desktop and display area. The review sample's prime feature is its QHD+ screen. Besides the gigantic surface area, this screen achieves very good results in almost all other sub-ratings. The high resolution of 3200x1800 pixels leads to a very fine and detailed reproduction. The naked eye does not perceive single pixels. This also results in a lot of room on the desktop and easily allows placing several windows, documents and charts beside each other on the desktop. 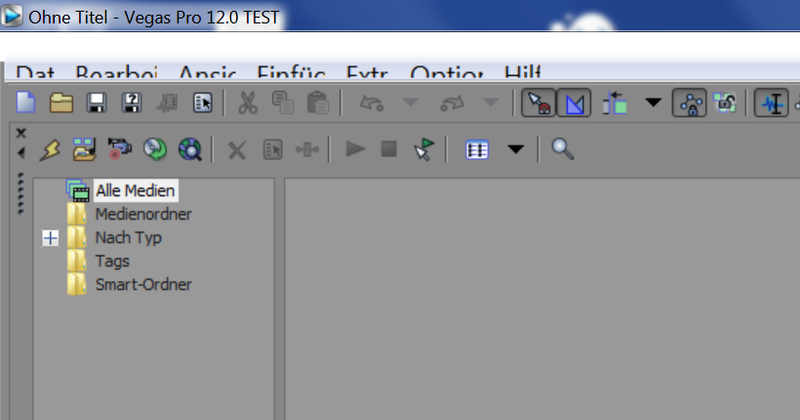 However, one drawback is that fonts, icons, and menu positions are much smaller. That can be resolved by increasing the display size in the system control in many cases. But that does not always work and sometimes a magnifying glass is needed to see the necessary items depending on the program and window size. We will categorize this as "teething problems". It should ultimately only be a matter of time before high-definition screens become widespread and programs are modified for these displays. Owing to the subjectively very good interpolation quality, pictures, videos, and animations benefit from the high pixel density even in low resolutions and look a lot better than on standard HD screens. However, the resolution has to be reduced every now and again because some buttons do not respond or the automatic resolution switching does not work. Alternative resolutions are widely supported and can be selected as desired. 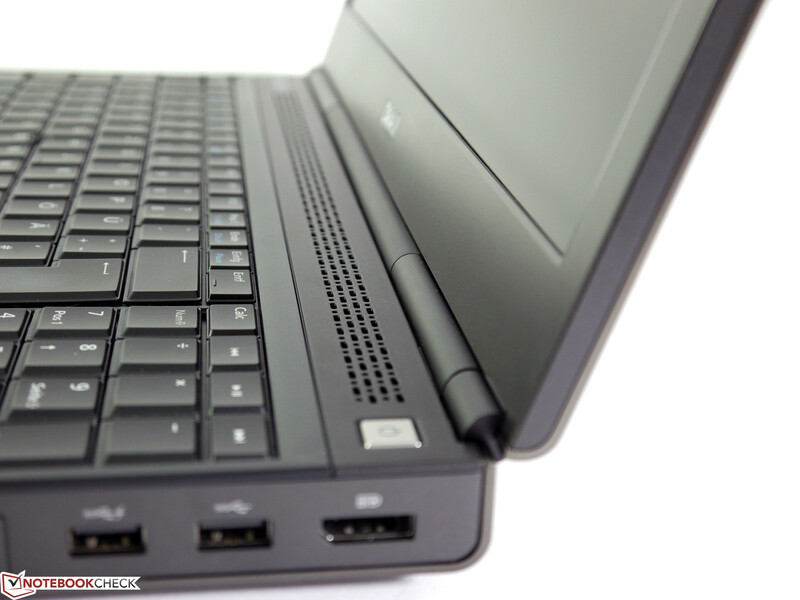 There are no longer limitations like we have often seen in Dell laptops. We ascertained a maximum screen brightness ranging from a minimum of 356 cd/m² in the upper left corner up to 393 cd/m² in the lower right corner. The illumination achieves a very good 91%. 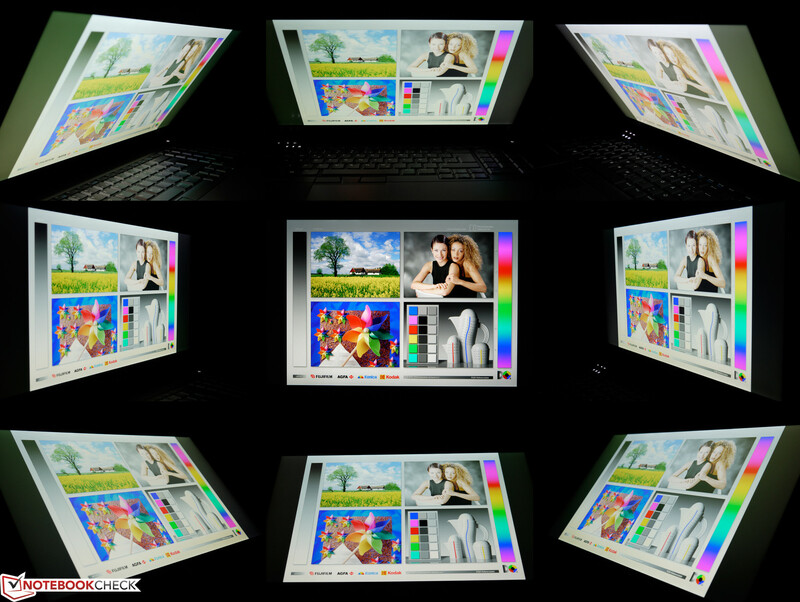 Brightness differences can only be seen in dark, single-colored content. 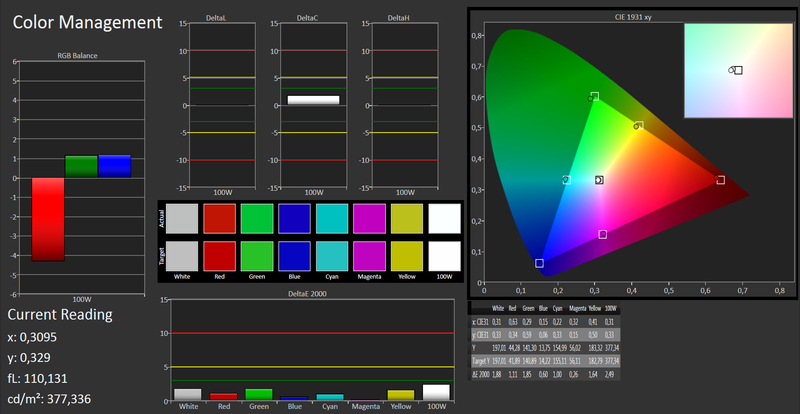 The screen's brightness can be set very precisely from a minimum of 48 cd/m² to its maximum in 15 levels. We measured 158 cd/m² in level 6. This brightness suffices for many indoor situations and will thus also be used in our Wi-Fi battery life test. 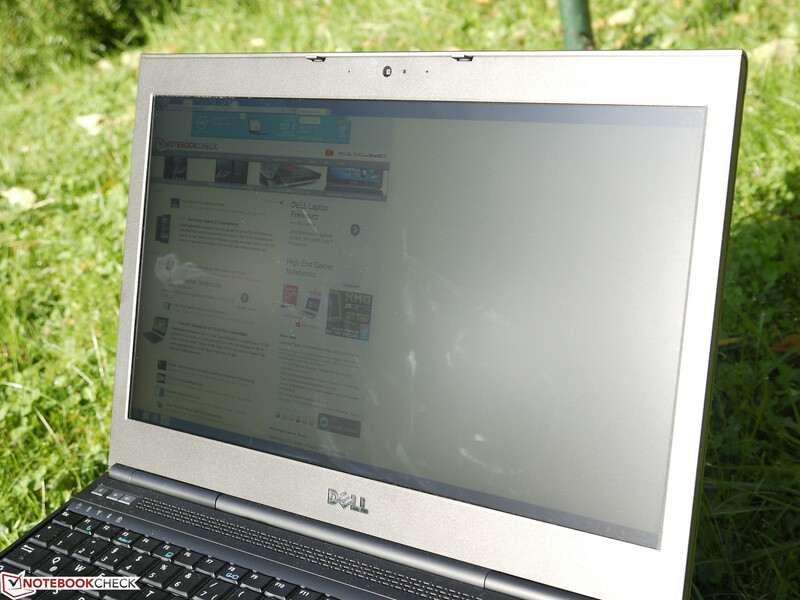 The screen benefits from the full, high maximum brightness as well as the screen's matte surface outdoors. Distracting reflections do not occur and contents are well-legible even in bright ambient light. 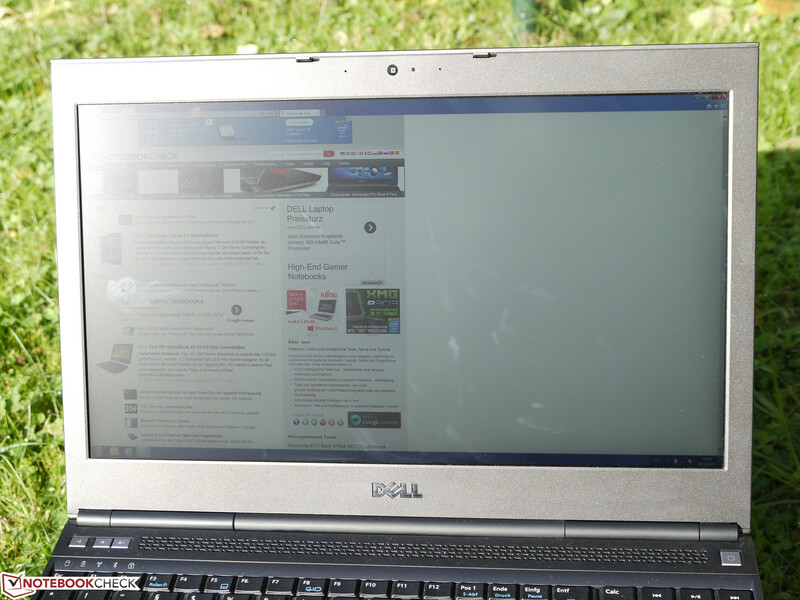 Using the laptop outdoors is thus possible with barely any restrictions. The ascertained contrast of 945:1 is clearly above the average of our review samples and can be called very good for laptop conditions. Pictures, videos, 3D objects and even games and written text in documents benefit from that. 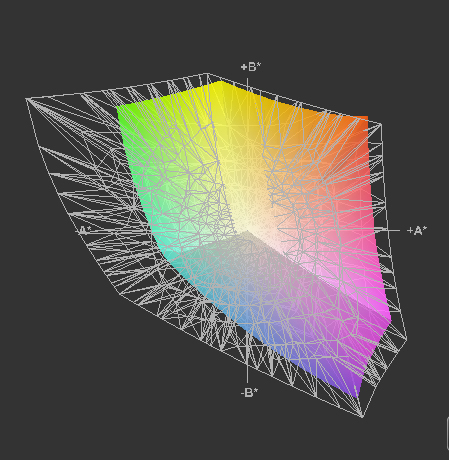 The sum of reproducible colors is quite high with over 85000 but is not completely within the sRGB color space. It is covered by approximately 98% (Correction 20.5.2015 due to a wrong sRGB-reference-profile) which should be enough for many application fields. A complete coverage of the sRGB color space is currently only possible with RGB LED screens in the laptop sector. 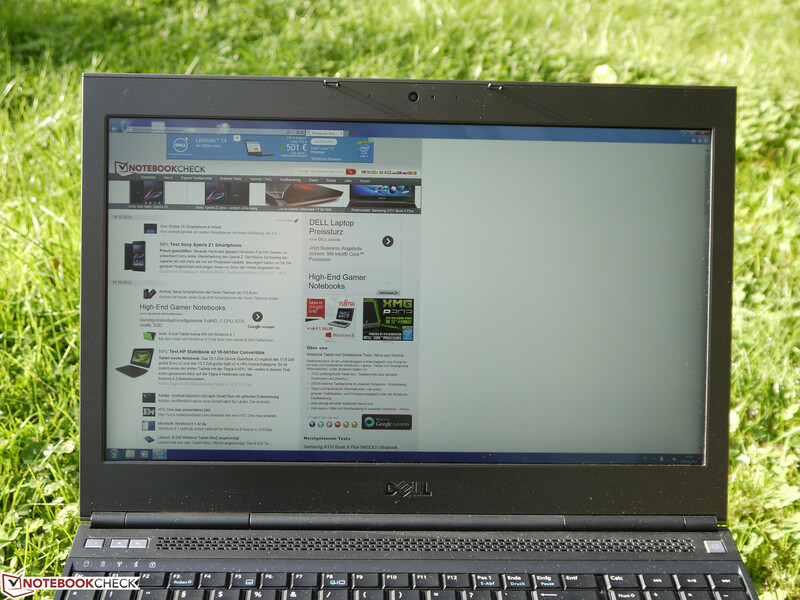 The screen's balance ex-factory is much better than otherwise known from laptop displays. The gamma rate runs pretty much along the ideal curve and the other measurements exhibit an astonishingly good result with an average DeltaE 2000 of 5.73 (grayscale) and 3.89 (mixed colors). 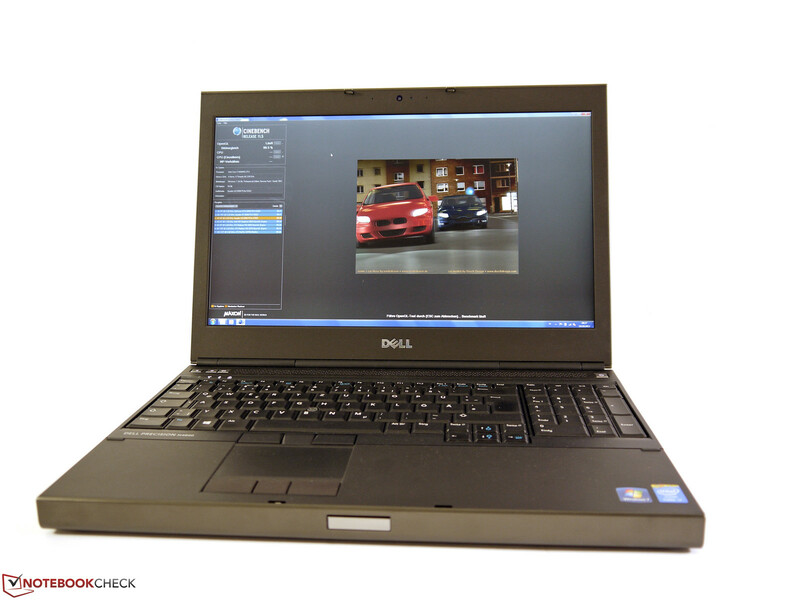 Nevertheless, professional users will not work out-of-the-box with Dell's QHD screen because the deviations in single cases are in a very visible range with a DeltaE 2000 of over 10. These shifts disappear after calibration and the user has in fact a really usable screen. 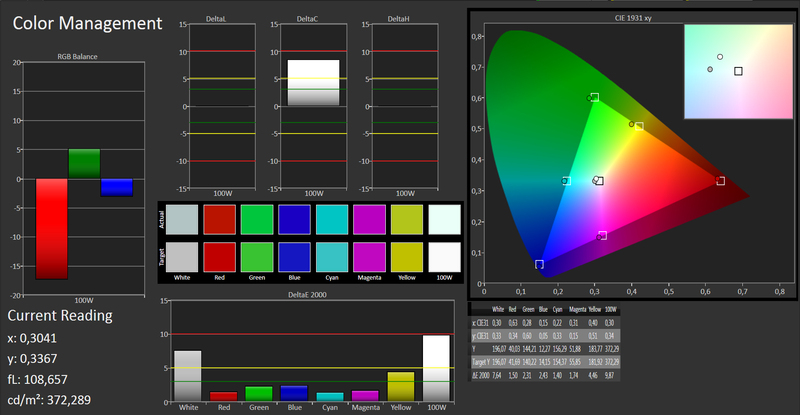 Besides the excellent DeltaE 2000 rates in color accuracy and grayscale, the RGB balance and gamma curve of course also bring a high measure of congruity. 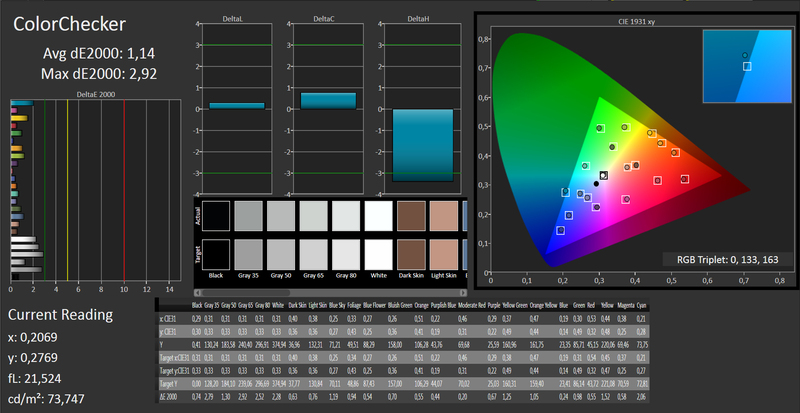 The viewing angle stability seamlessly lines in with the until now exceptional results. The user can benefit from very wide viewing angles both horizontally and vertically. Increased brightness losses and a visible color cast only have to be accepted when looking up or down from the sides. The main focus in a professional workstation is naturally placed on performance. 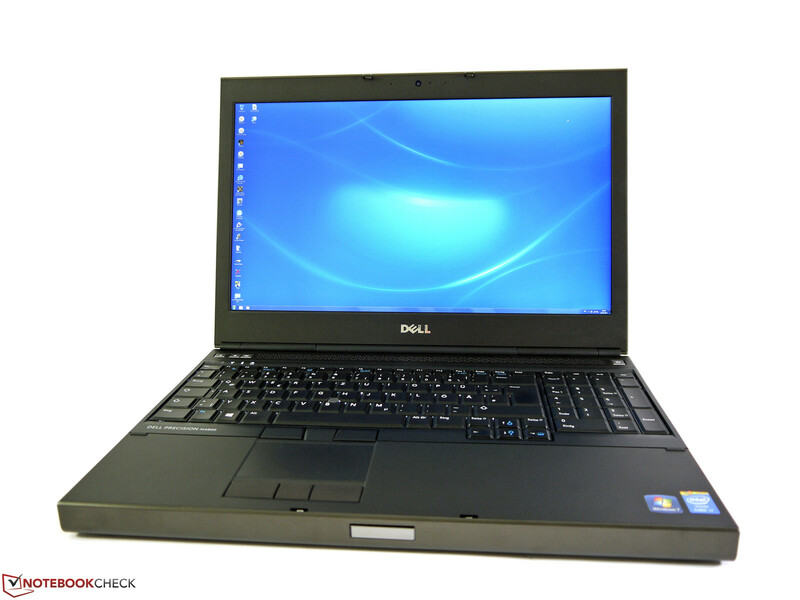 Here, as expected from Dell, the user can basically draw on abundant resources. However, the choice of components is limited for single buyers and private individuals. 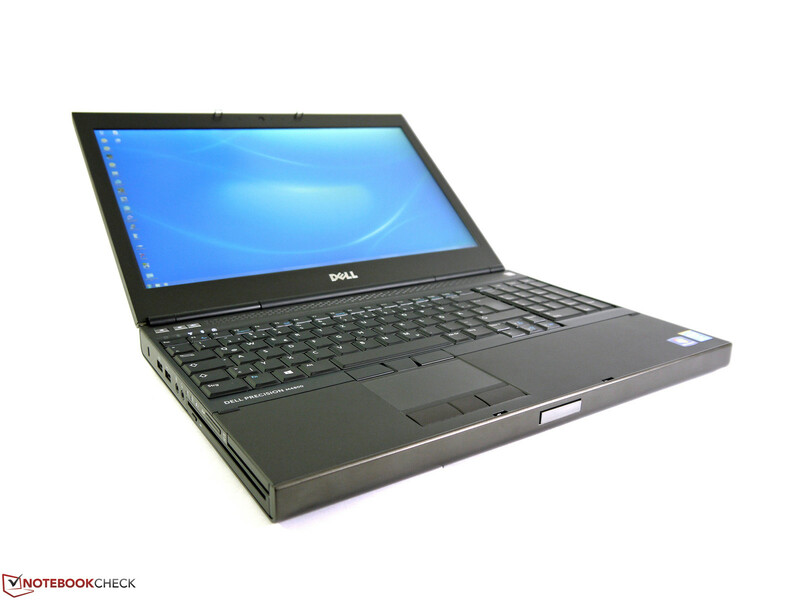 Dell currently only offers three pre-configured models for this group of buyers which is nevertheless to cover a vast and particularly attractively priced spectrum. 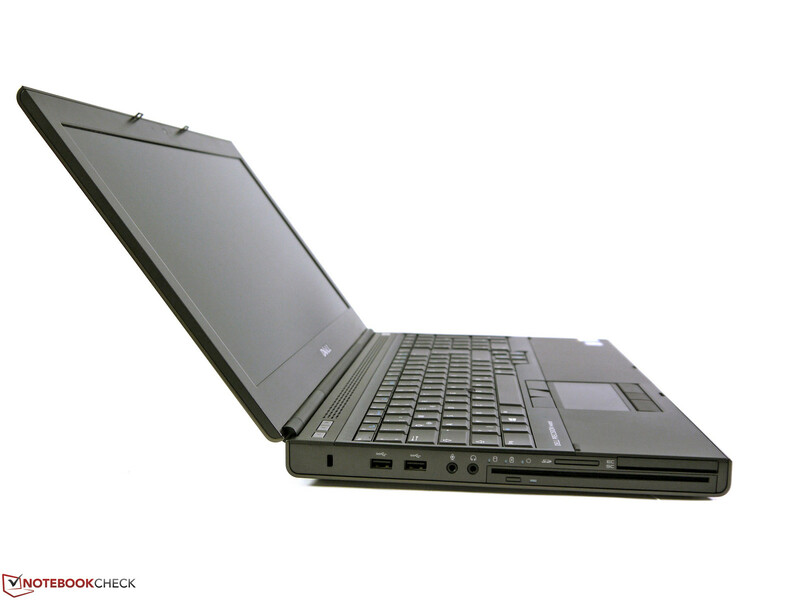 However, classic business customers and wholesalers can configure the laptop freely and implement special needs when they order a sufficient number of units. 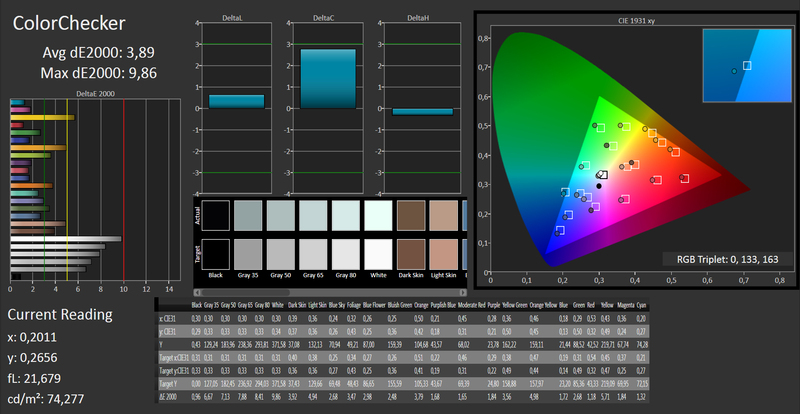 Our review sample is a pre-configured version and represents the present top model in this field. Dell installs a very high-performance processor with Intel's Core i7-4900MQ CPU. The RAM configuration of 16 GB is also attractively sized and the swift SSD storage device will usually suffice with a capacity of 256 GB. 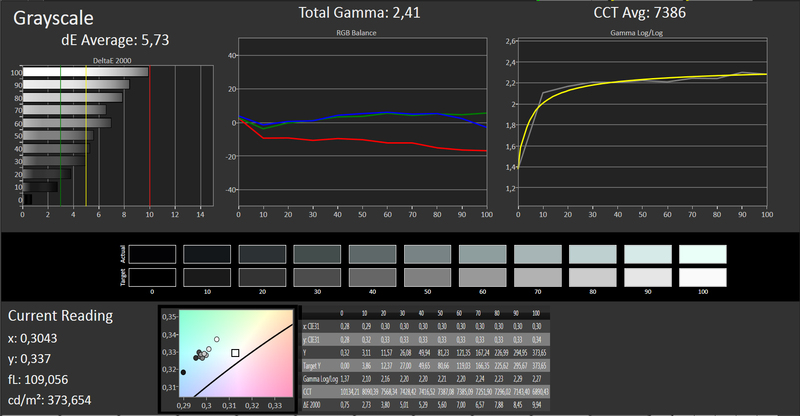 Nvidia's professional Quadro K2100M performs graphic calculations and the user can, as mentioned above, look at its results on the excellent QHD+ screen. 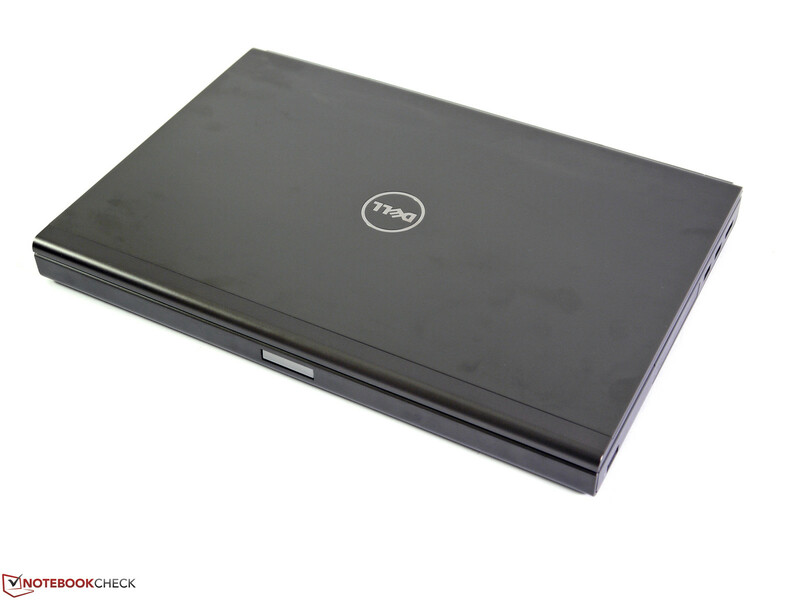 Dell alternatively offers two other professional graphics chips, innumerable storage devices and working memory options, many CPUs and smaller configuration details. The base price currently starts at 1419 Euros (~$1957, net) and is, as usual, open-ended. Intel's Core i7-4900MQ processor is currently ranked 10 in our extensive CPU benchmark list and is only topped by two Extreme Editions and desktop CPUs. 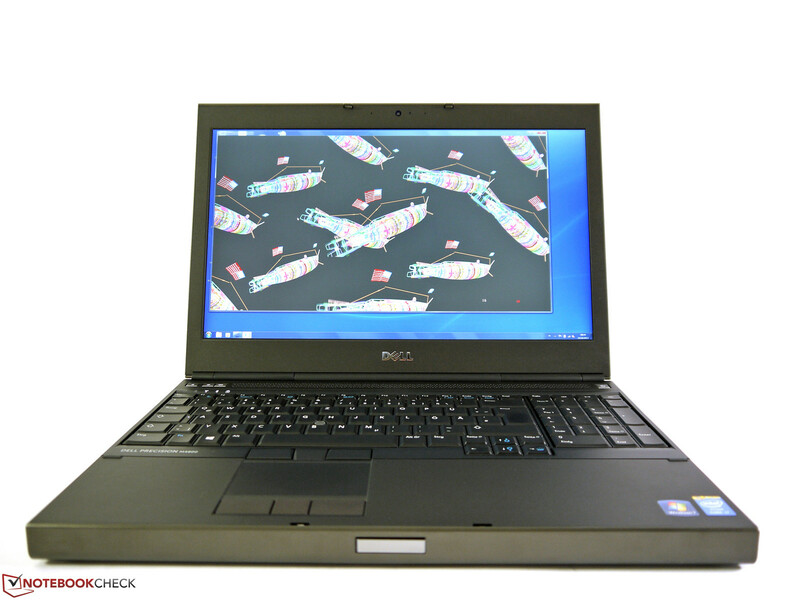 More performance in a laptop is virtually unthinkable and reflects the workstation's performance claim adequately. 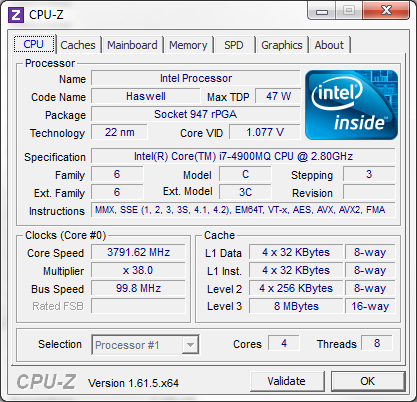 The key features of this high-performance processor are technologies such as Intel's Turbo Boost (2.8 - 3.8 GHz) and Hyper Threading (up to 8 threads simultaneously), which provide the required performance development according to the application field. The benchmarks scores are as expected in the top ranks and confirm the high expectations. 7112 points (single-thread) and 27537 points (multi-thread) were achieved in Cinebench R10 64-bit. The wPrime 1024 calculation finished after just 228 seconds. The quad-core places itself at the top of all previously tested Windows systems with a 59-fold speed in audio converting via iTunes, and the CPU lines into the performance range of the high-performance comparison processors in video converting via Cyberlink's MediaEspresso. 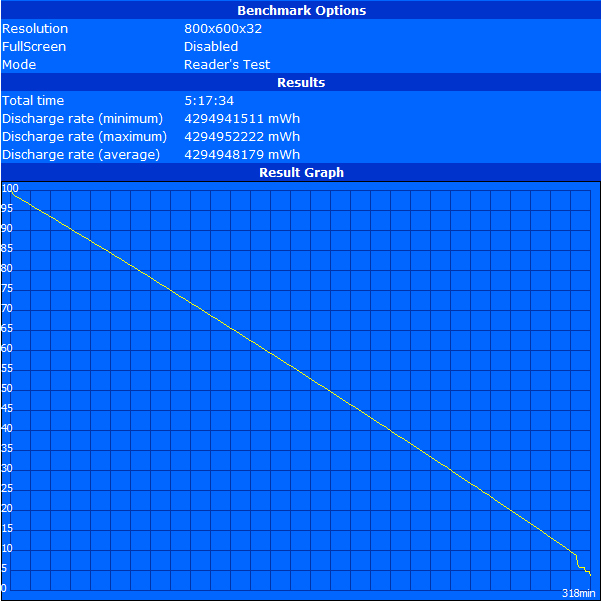 Performance throttling was not noticed during full load, but the computing power was throttled by about 20% in favor of battery runtime in battery mode. The system performance is on a very high level and does not exhibit any weaknesses. The working memory makes use of the dual-channel mode and the swift storage device invariably ensures a subjectively speedy responsiveness. As a result, no task is too difficult for this workstation and it quickly performs all demands. Thus, the device achieved a high 5646 points in PCMark 7 and 18753 points in PCMark Vantage. A solid state drive with a capacity of 256 GB (gross) from Samsung is installed as the storage device. 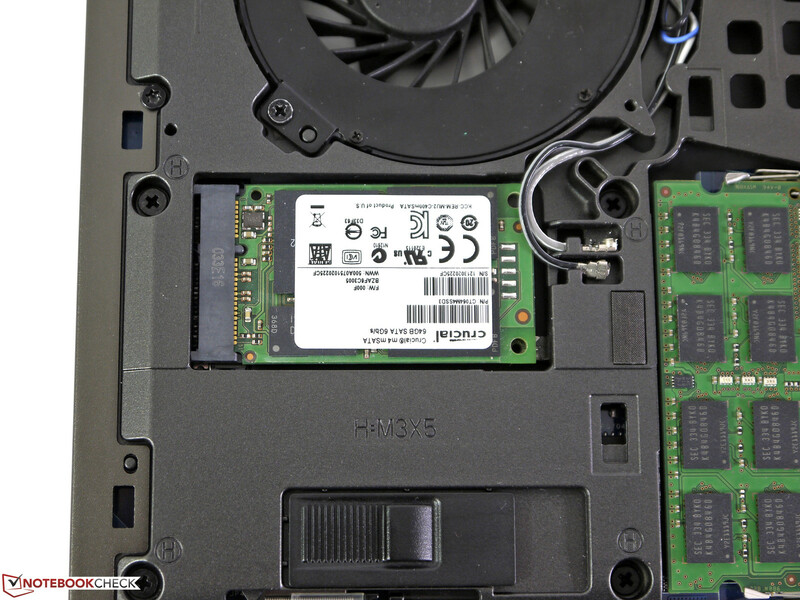 It has a height of 7 millimeters, is connected via SATA 6G and achieves transfer rates of over 500 MB/s (read). 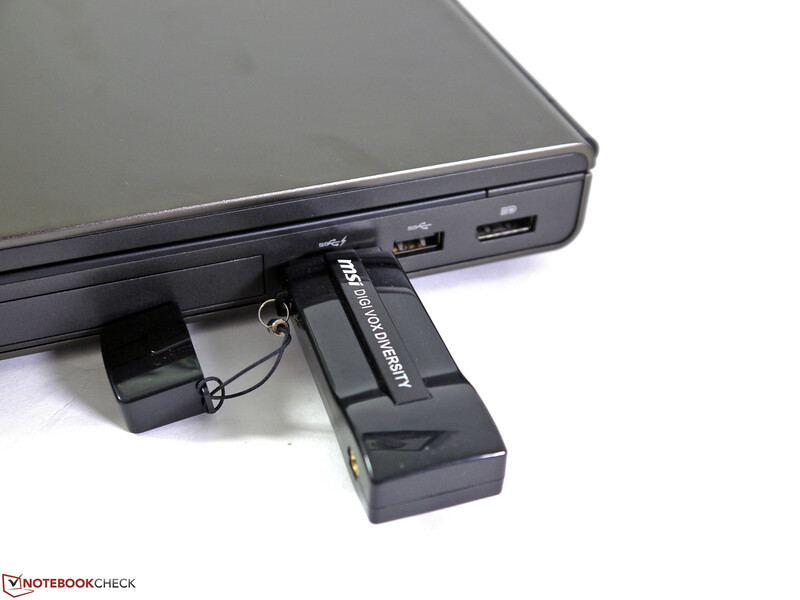 This storage can be easily expanded by using an SSD in mSATA format. It is also possible to replace the DVD burner with another storage device via an optionally available 2.5-inch drive caddy. The installed drives can then be configured in various RAID arrays and thus suit individual needs. The possibilities are vast and efficiently reflect a fundamental feature of a workstation - its upgrade options. Nvidia's Quadro K2100M is the immediate successor of Nvidia's Quadro K2000M that was frequently installed in mobile workstations of the former model year. 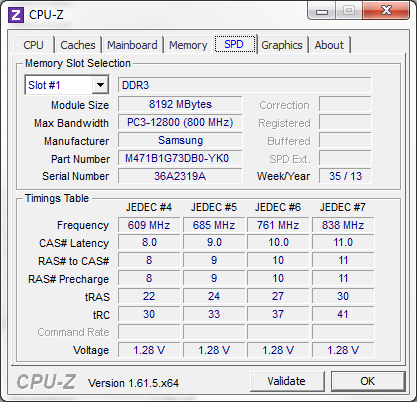 It now features 576 Shader Units, the core clock is 666 MHz and the GDDR5 graphics memory clocks with 752 MHz. As usual, the Quadro line optimized for professional applications has a special BIOS and dedicated drivers. 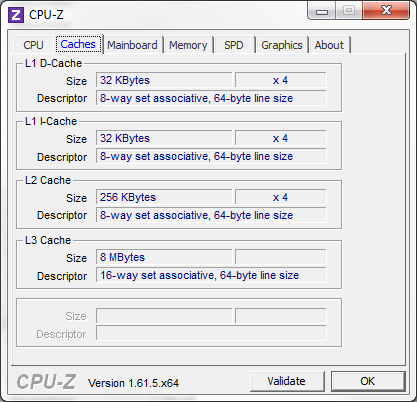 This enables speeding up individual OpenGL functions significantly which in turn is often beneficial for professional software. Compared with last year's model, Nvidia's Quadro K2100M manages to gain points in all areas of the SPECViewperf.11 benchmark. However, it cannot dethrone AMD's FirePro M4000 in this performance category in Lightwave. With 56 fps, the Quadro K2100M is on a par with Nvidia's GeForce GTX 760M in Cinebench R11.5's OpenGL Shading. At the same time, it also manages to marginally beat AMD's FirePro M4000 that achieved approx. 55 fps. However, the performance compared with powerful consumer graphics chips that use DirectX rather than OpenGL will likely be limited. Solely pure computing power counts here due to the lack of optimization. This, for example, includes Autodesk Inventor or newer versions of AutoCAD (from 2013) in the professional field. Here, just like in other DirectX applications, Nvidia's Quadro K2100M is located a bit above Nvidia's GeForce GT 750M and below Nvidia's GeForce GTX 760M. 10624 points was achieved in 3DMark Vantage and 2601 points in 3DMark 11. We did not ascertain CPU throttling during full load. However, a performance decrease of approximately 30% has to be accepted in battery mode. For example, only 33 fps instead of 56 fps was achieved in Cinebench R11.5 OpenGL Shading. Besides a usually much lower system load, results will be presented noticeably faster when tasks can be performed by a graphics unit rather than the CPU (GPGPU). 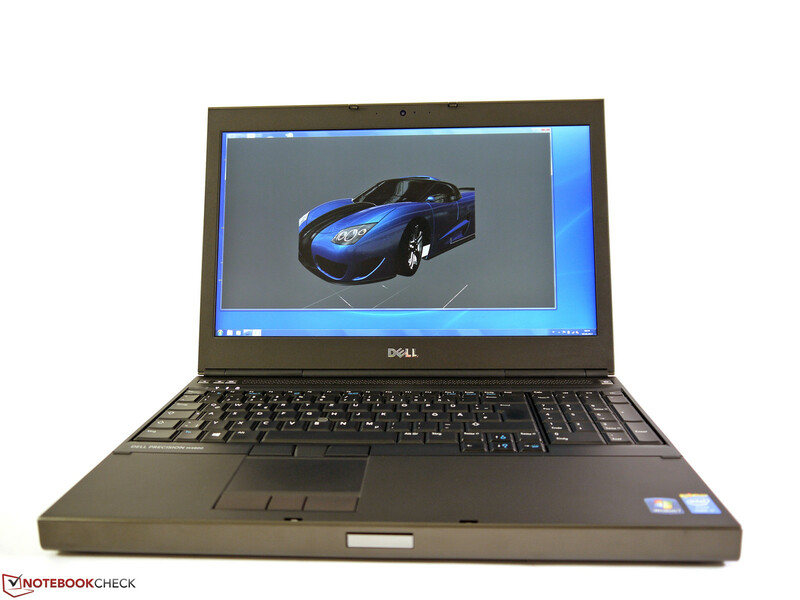 We examined the performance of the platform-independent and open OpenCL interface as well as Nvidia's proprietary CUDA engine of Dell's Precision M4800. Intel's QuickSync Video cannot be used because the integrated Intel HD Graphics 4600 is not active. We considered the areas of video and image editing, financial math, encryption, ray-tracing and video converting in the tests. A few tasks have been added to our repertoire and do not yet have comparison rates. We will complete the charts with competing professional graphics chips as soon as results from other workstations are available. In the past we repeatedly observed that common resolutions, e.g. 1366x768 or 1600x900 pixels, could not be selected in Dell's laptops. 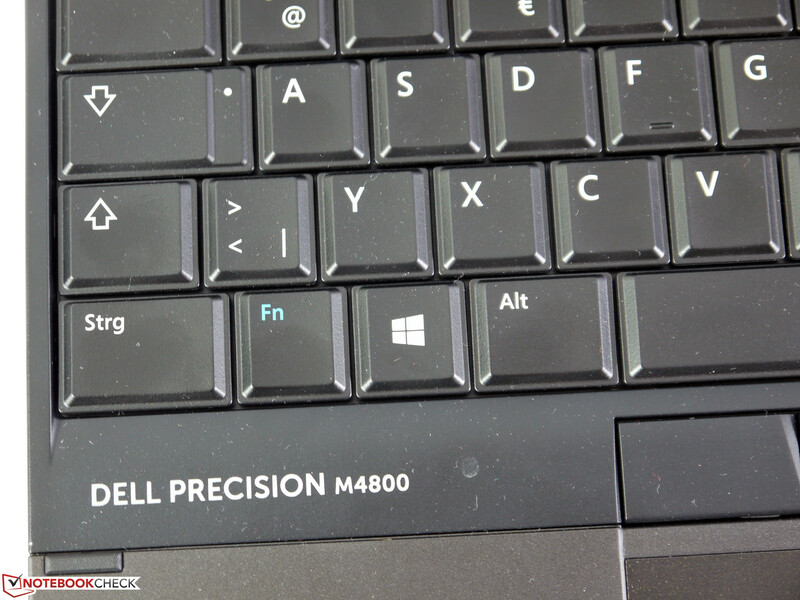 This is different in Dell's Precision M4800. Here the user has a wide selection of possible settings. We mainly performed the gaming tests in the specified settings but we also dared a glance at the QHD+ resolution in a few games. Many titles can be played well in reduced quality settings but most do not yet support such high settings and thus the user currently does not benefit much from them. The automatic switching from the native resolution to a lower game resolution did not always work flawlessly in the test. For example, we first had to select 1920x1080 pixels in the control panel to test Sleeping Dogs in Full HD. Other problems could turn up with the buttons. In World of Warcraft we could first use the start icon after reducing the system resolution. However, this is no big issue because a good result is achieved quite quickly in most cases. 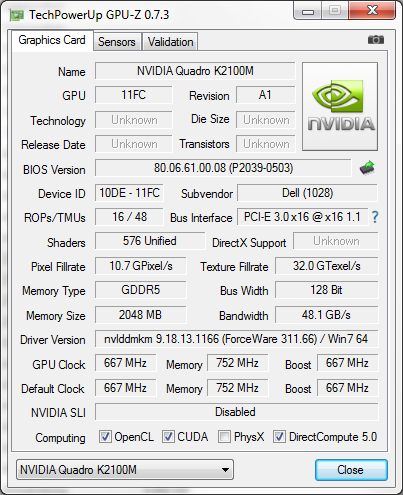 In terms of performance, Nvidia's Quadro K2100M is usually still sufficient for our high test settings. Consequently it is throughout possible to play an occasional game. The review sample's noise development ranges from silent to loud depending on the load. The fan remains inactive for a long period in low load and only sets in sporadically just to stop again after a moment. The cooling system is very audible in medium load with a noise level of 37.3 dB(A). However, this state is not unpleasant yet owing to the noise's restrained characteristic. The casing is cooled optimally during full load using the "Maximum Fan Levels" setting but reaches 51.2 dB(A) which gets disagreeable over a longer period. Readjusting the settings a bit and accepting a higher casing temperature would certainly be possible here. 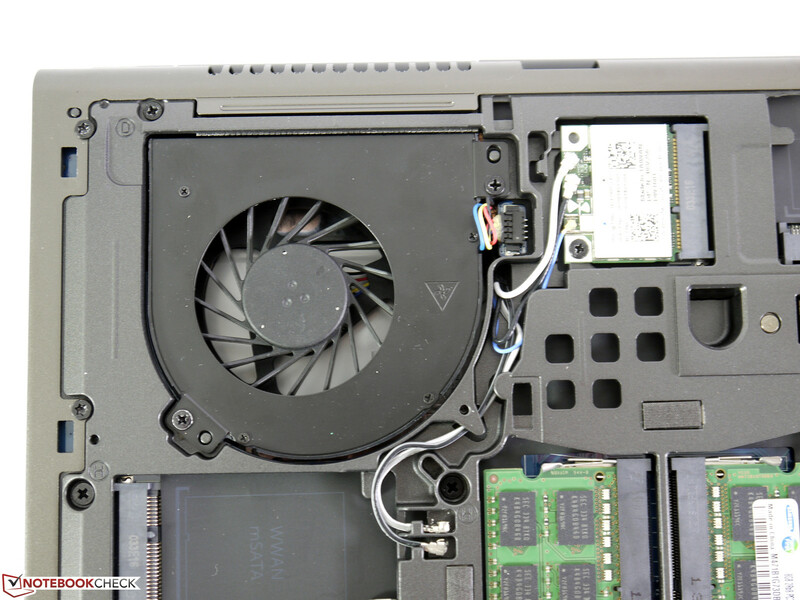 The casing of Dell's Precision M4800 remains absolutely cool owing to both fans that run vehemently during load. We even measured lower surface temperatures during full load in some places than during low computing load. We only ascertained higher rates in the rear by the vents and on the base plate's center with a maximum of 44.9 °C and 37.8 °C. This does not lead to restrictions and using the device on the lap would even be possible in full load. The temperatures are much lower compared with the precursor. 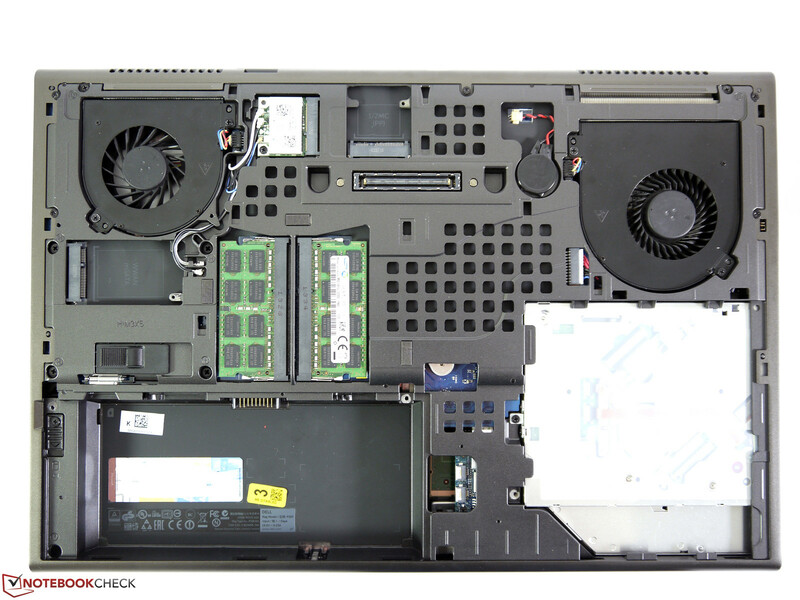 We measured up to 55 °C on the underside of Dell's Precision M4700. (+) The average temperature for the upper side under maximal load is 27.7 °C / 82 F, compared to the average of 31.1 °C / 88 F for the devices in the class Workstation. (+) The maximum temperature on the upper side is 32.9 °C / 91 F, compared to the average of 37.1 °C / 99 F, ranging from 23 to 69.8 °C for the class Workstation. (+) In idle usage, the average temperature for the upper side is 27.7 °C / 82 F, compared to the device average of 31.1 °C / 88 F.
(±) The average temperature of the palmrest area of similar devices was 27.8 °C / 82 F (-0.5 °C / -0.9 F). The two speakers submerged above the keyboard supply a comparatively agreeable sound that even includes mids and bass. Thus several options to positively influence the existing treble-heaviness are available via manual settings. The volume control range is finely graded which allows precise tuning and also provides a clear maximum volume. Although the speakers cannot compete with the quality of external speakers or headphones, they do offer an acceptable quality for this device category. 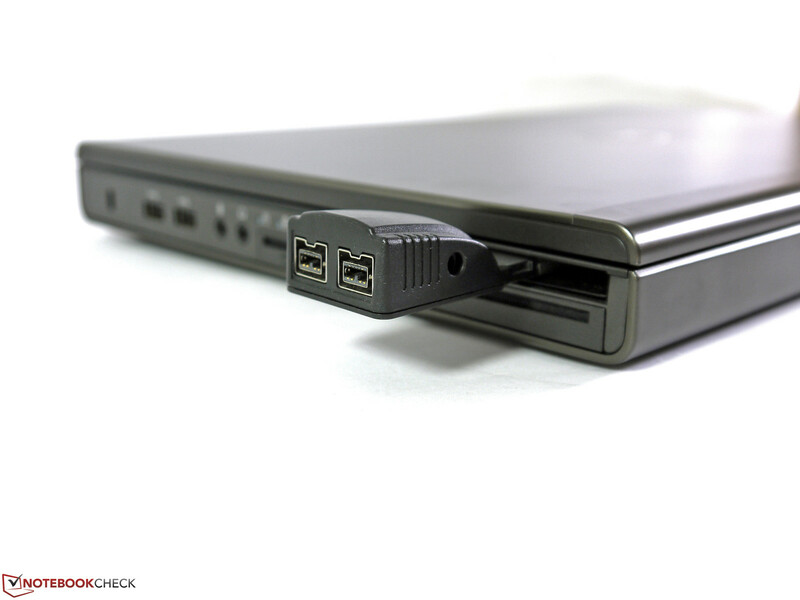 External audio devices can be connected via the 3.5 mm jack, USB, Bluetooth or HDMI. The Precisions generally feature AMD's Enduro or Nvidia's Optimus technology to switch between the energy-efficient processor graphics and the dedicated professional graphic depending on the task. However, the integrated Intel HD Graphics 4600 cannot be used due to the QHD+ screen installed in our review sample and is disabled. This naturally has an impact on the power consumption, which is much higher with a minimum of 19.6 watts than that of a system with an enabled Intel graphics. However, the screen also takes its toll and consumes almost 8 watts more from the lowest to the highest brightness level. This can add up to just under 35 watts even when the system is not working hard and is clearly too high for routine office work. When the components are used rationally, the medium load power consumption increases to 80 watts and to 107 watts during full load. The power supply has an output of 180 watts and thus provides more than sufficient reserves. 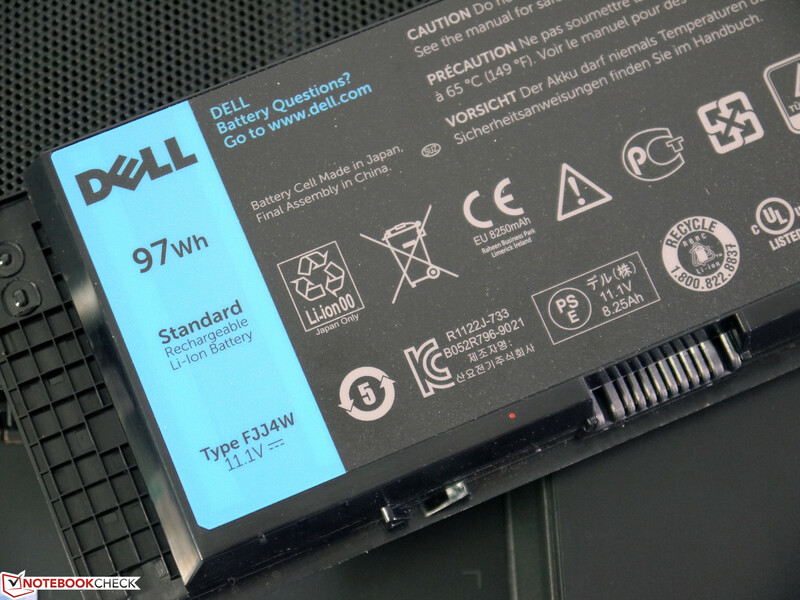 The high-capacity, 97 Wh battery successfully prevents the runtime-calamity that is presumed at first. 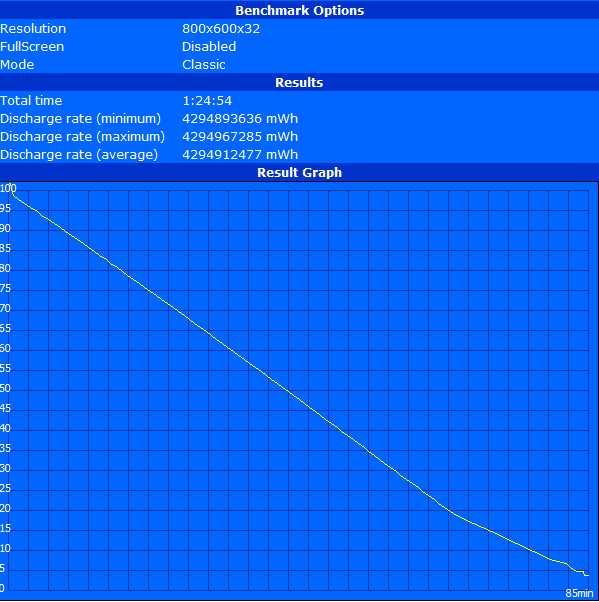 The laptop shut down after 318 minutes in Battery Eater's Reader's test using minimum brightness, disabled wireless modules and maximum energy-saving options. The Wi-Fi test provides more practical figures. Almost exactly 3 hours of battery runtime, using brightness level 6, energy-savings mode and wireless on, at least allows being away from the outlet for a while. It is possible to watch DVDs for about the same time in brightness level 8 and with disabled wireless modules. The runtime nosedives in full load despite the lower performance of 20 to 30% and is only enough for almost 1:30 hours of work. 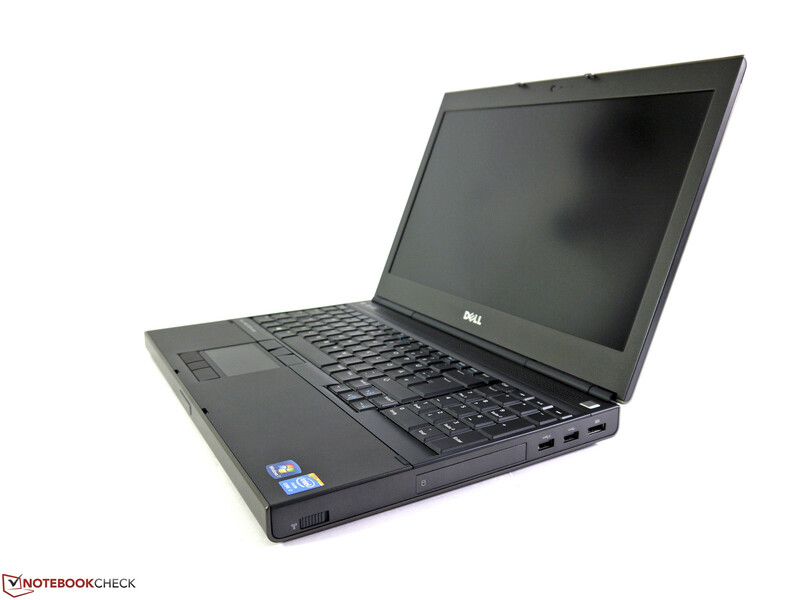 Dell has splendidly updated its 15-inch mobile Precision M4800 workstation. Many things that could be improved were improved. While the components inside have almost completely been modernized, the casing has remained virtually untouched. All in all, the review configuration convinces with high performance that could only be better in demanding 3D graphics tasks. 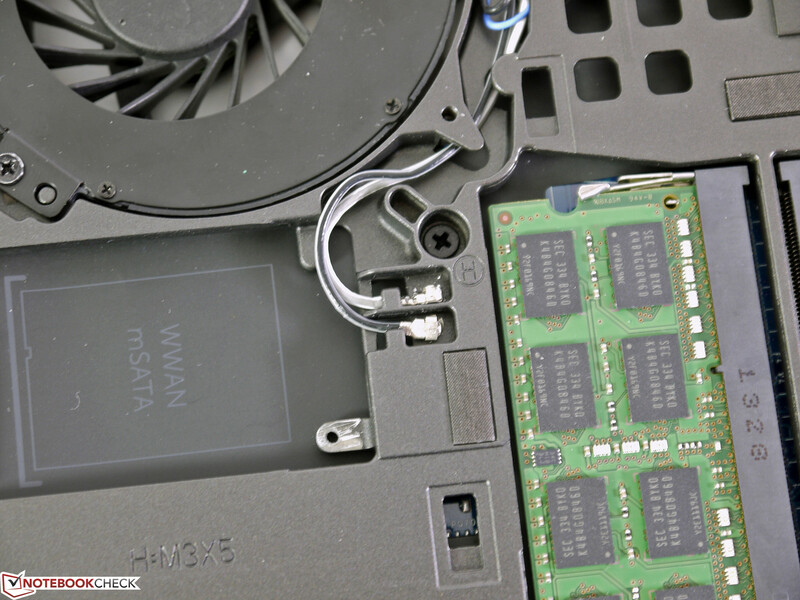 The fans that work very well during full load keep the casing's surfaces cool above the average and ensure unrestricted use of this workstation. However, the loud operating noise that can be very distracting after a longer time has to be accepted in this state. 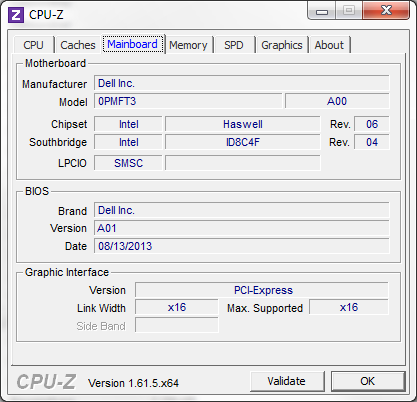 The disabled Intel HD Graphics 4600 also has several adverse consequences. 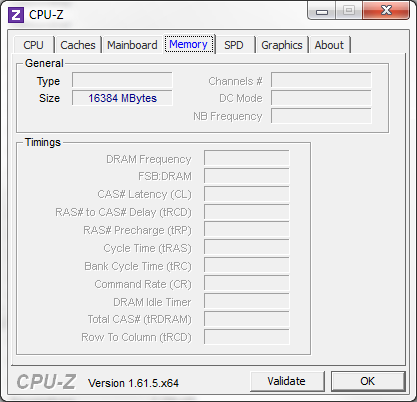 The power consumption during low load is high and thus the battery runtimes clearly remain behind the possibilities despite the high-capacity battery and Intel's QuickSync Video cannot be used. Those are the drawbacks that have to be accepted in favor of the excellent QHD+ screen. Besides the extremely high resolution, the screen in the review sample also convinces in all other sub-scores with well above-average rates. Finally, the keyboard that is suitable for prolific typists, the build quality, the interfaces and their positioning, the upgrade options, and the warranty period of 36 months with on-site service for the next business day are all still of the same high standard. Just as unchanged is the ambitious price of approx. 2850 Euros (~$3931) for the pre-configured review sample. Dell simply knows that it has created a great workstation. 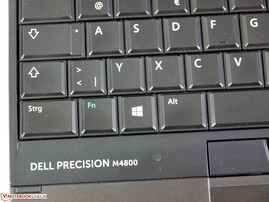 Dell Precision M4800: 15-inch workstation. ...due to its many very good qualities. Still worthy of reference is its rigidness, maintenance-friendliness and flexible upgrade options. 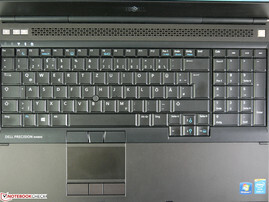 ...which can be well tolerated considering the many advantages particularly for a laptop from the workstation category. 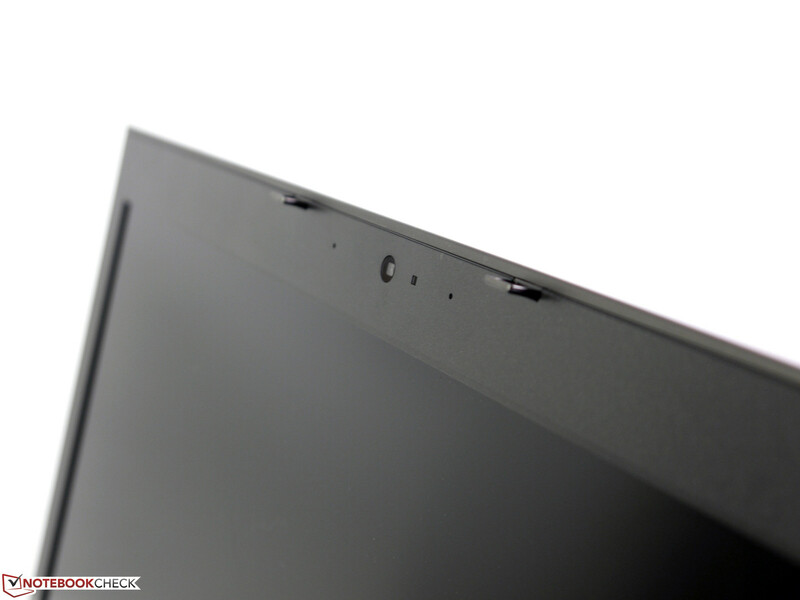 The display has a wide opening angle, features a matte surface and a resolution of 3200x1800 pixels. 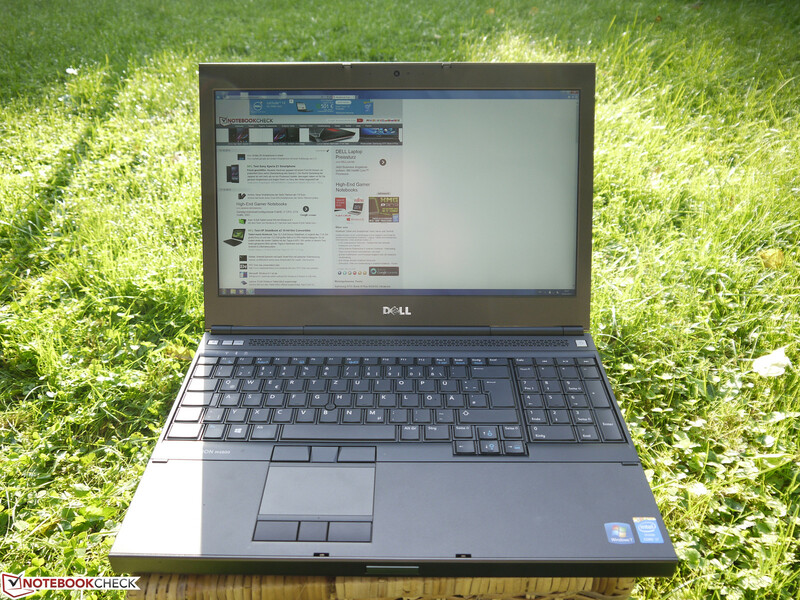 The screen's other qualities are throughout impressive and top in the laptop sector. 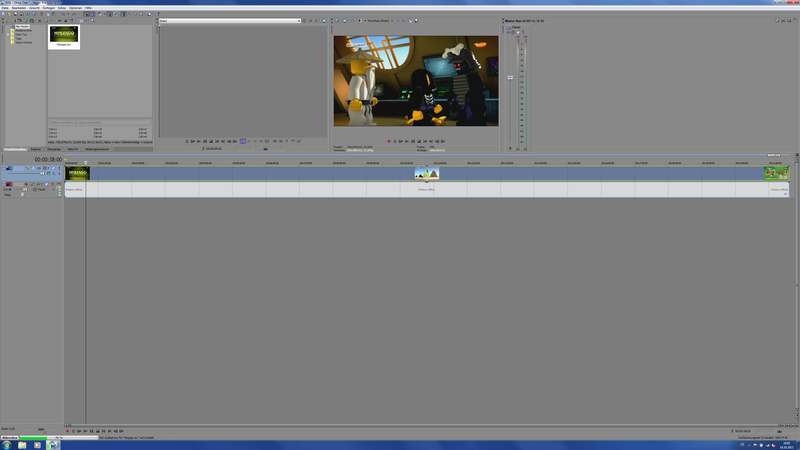 The power of the professional workstation is, as expected, very good. The system performance does not exhibit any weaknesses. The high performance only has an impact on noise development during full load. That gets annoying in the long run, but the casing stays absolutely cool. ...but also on the rear. This leads to few cables in the hands' work space particularly in stationary use. 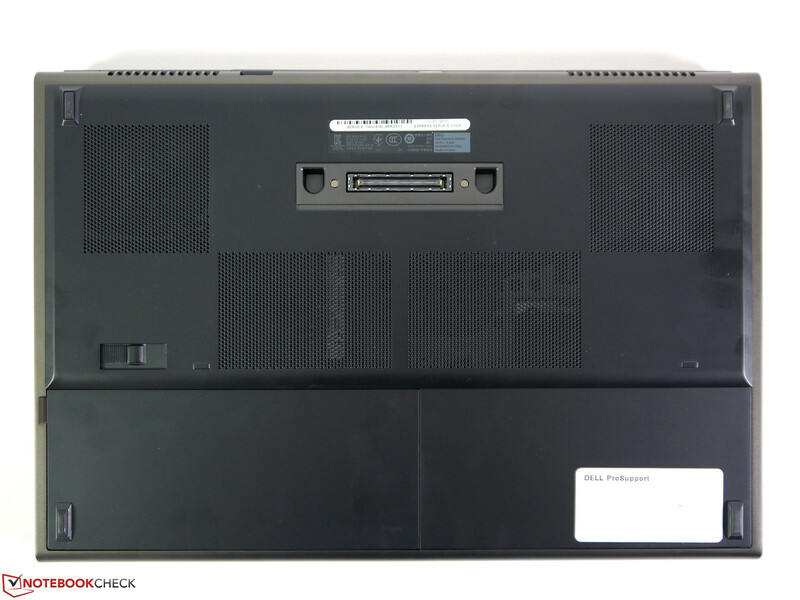 ...Dell's Precision M4800 comes with three monitor ports. 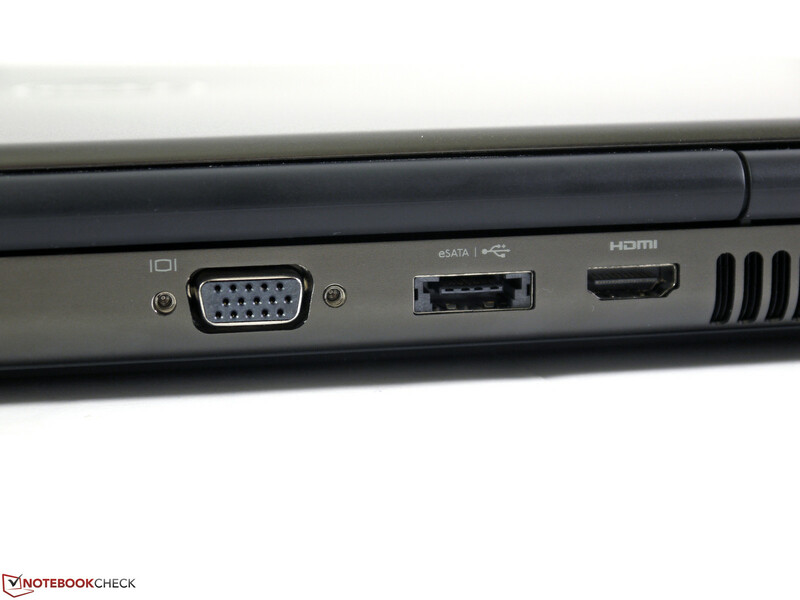 The analog VGA port's signal quality provides a sharp picture on an external monitor in Full HD. ...because inserted cables or expansions could obstruct neighboring ports. The 720p webcam is supported by a dual-array microphone and is quite suitable for video chats. The vital components are underneath the base plate. The docking port has been adopted and can thus be used with older docking stations. The battery and two screws have to be removed before lifting off the base plate. The CPU and GPU are cooled by their own fan. 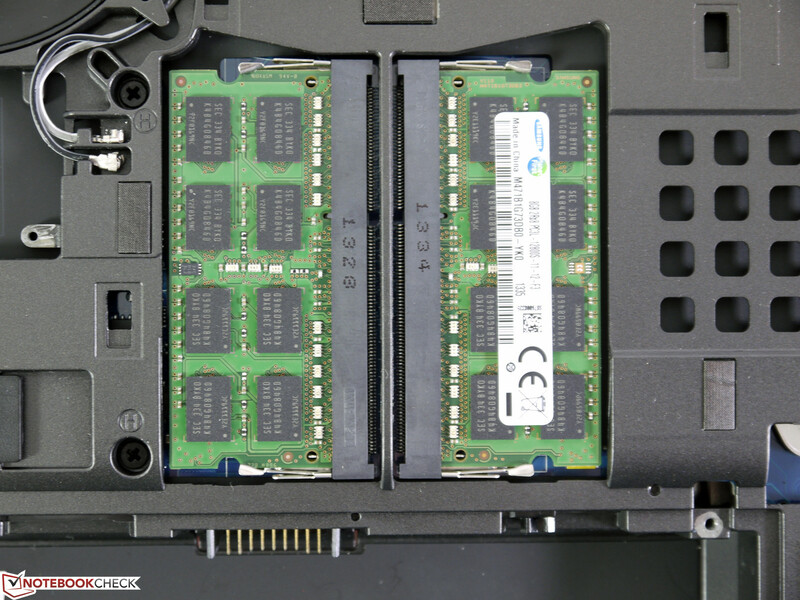 Two RAM banks on the underside are occupied; two more are under the keyboard in the quad-core models. 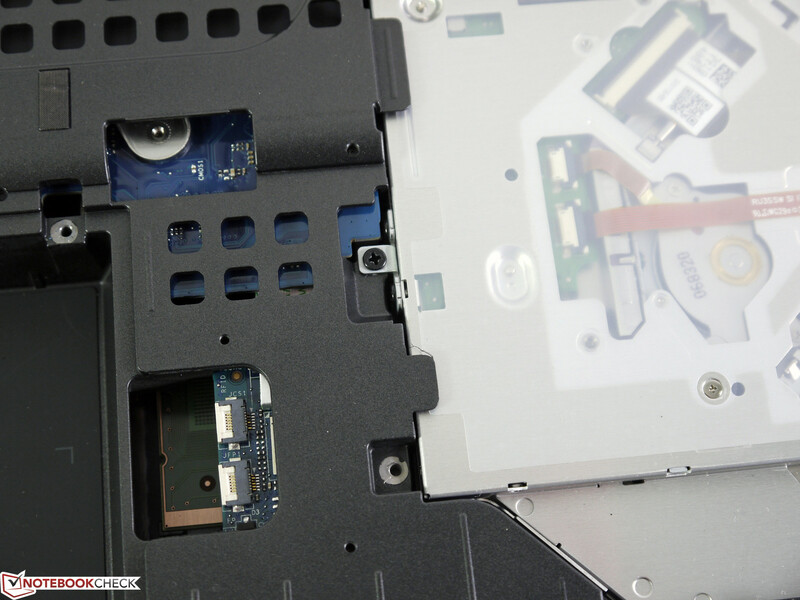 The WWAN slot can also be used for mSATA SSDs. The necessary cables for the WWAN module are installed. Another, half-sized mPCIe slot is still empty. 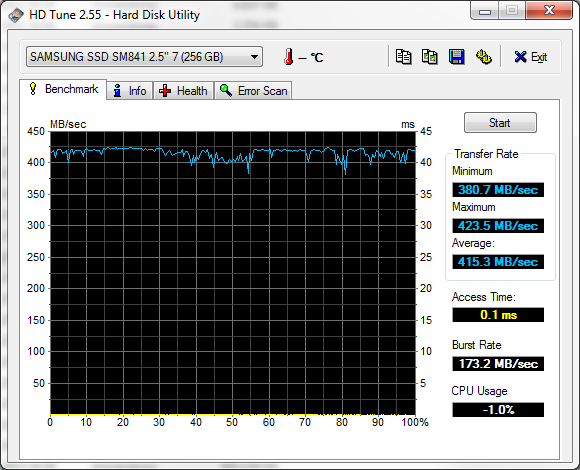 mSATA SSDs, like Crucial's M4 here, can be maxed out up to SATA 6G speed. 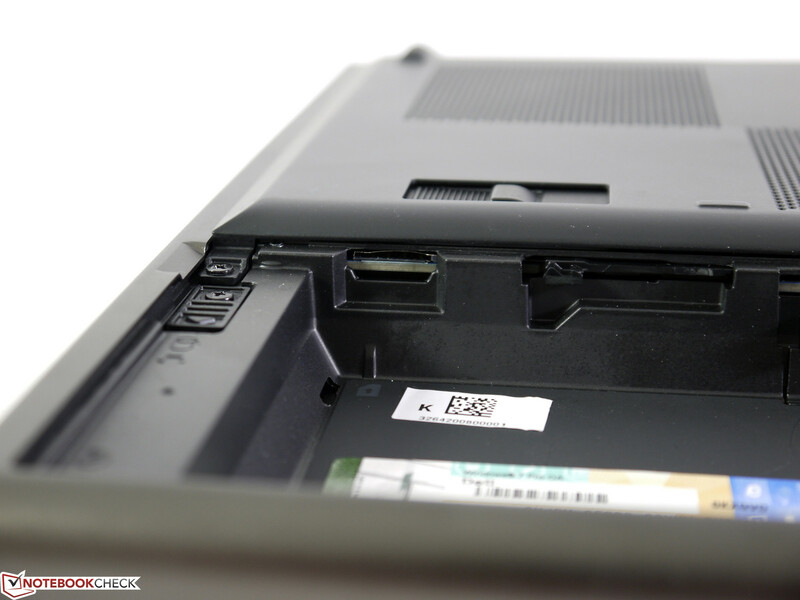 The optical drive is secured with one screw and can optionally be replaced with a 2.5-inch drive caddy. 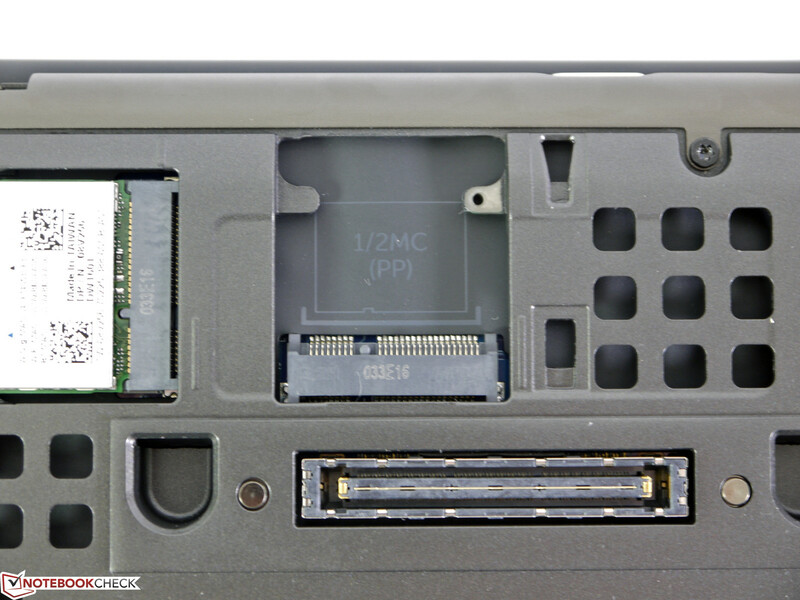 The SIM card slot is still found in the battery compartment. The excellent QHD+ screen is very impressive. But the combination of high performance and silent operations during low load is too. The integrated Intel HD Graphics could ensure lower power consumption and consequently longer battery runtimes, but the QHD+ screen is too much for it and so it has been disabled. That Dell launched such a decent casing with its Precision 4600 that it still serves as the basis for a very good workstation today. The contending models from this model year are just being released. 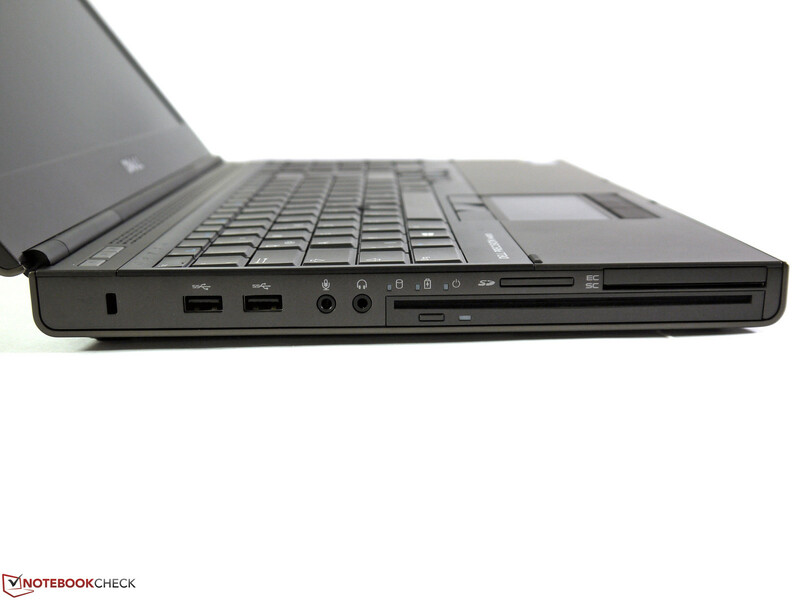 We have not yet tested Lenovo's ThinkPad W540, HP's ZBook 15 or Toshiba's Tecra W50 new in the round. 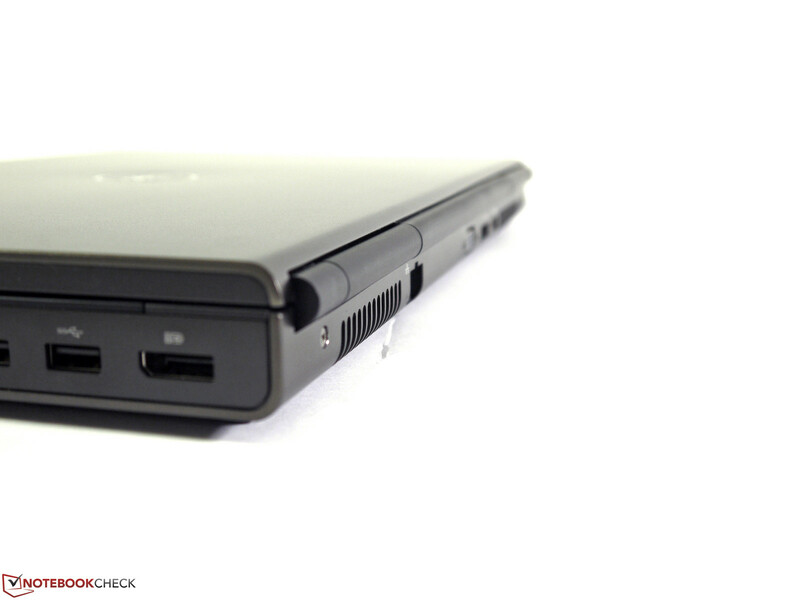 An alternative might be found in the models from the previous year now on sale: Dell's Precision M4700, HP's EliteBook 8570w, Lenovo's ThinkPad W530, Fujitsu's Celsius H720 or MSI's GT60WSPH.